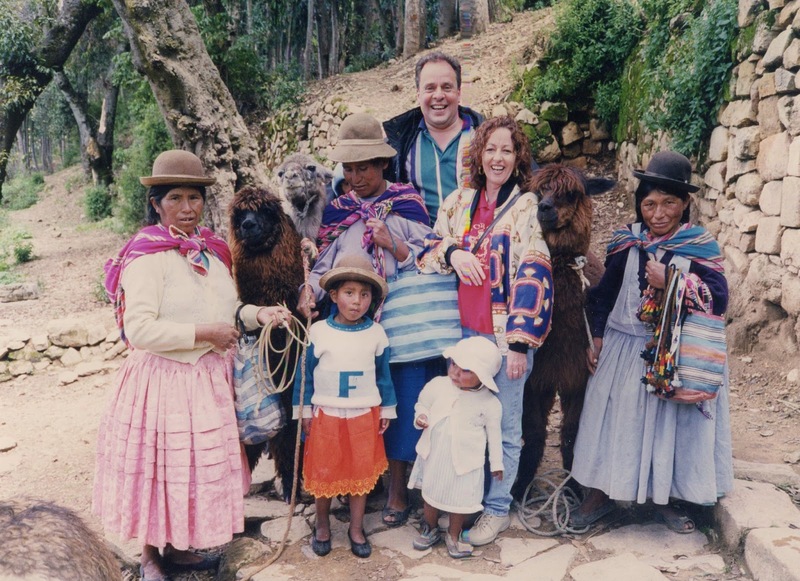 On my 43rd birthday I finally decided to head off to South America on a journey to explore my roots. 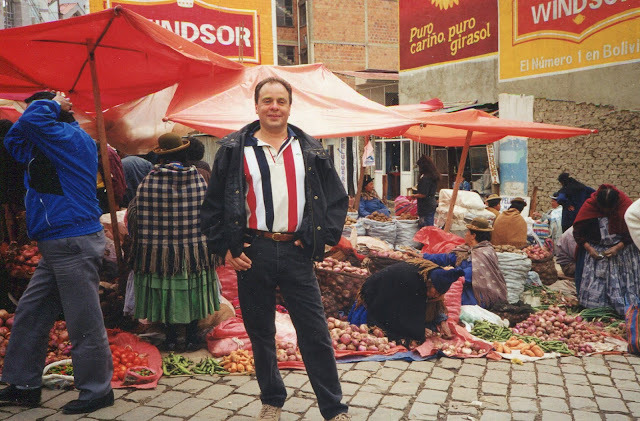 My father, who was originally from Bolivia, had emigrated to Canada in the 1950’s, married my mother, a Canadian from Saskatchewan, and I was born in Vancouver. 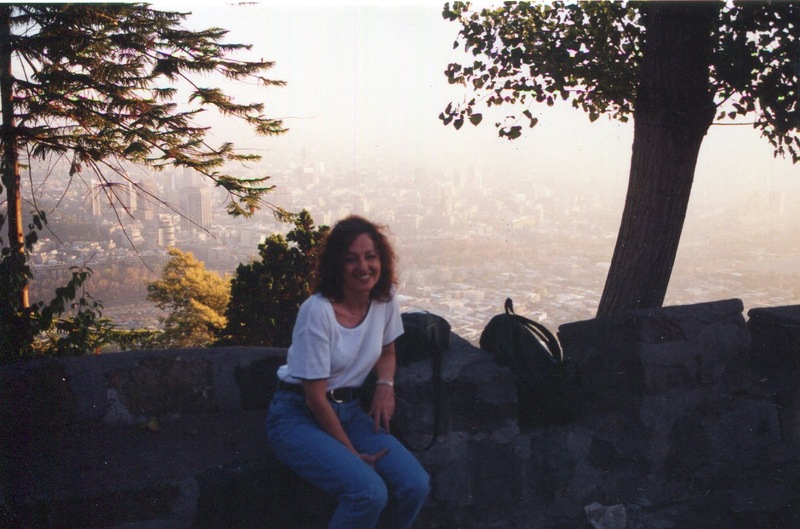 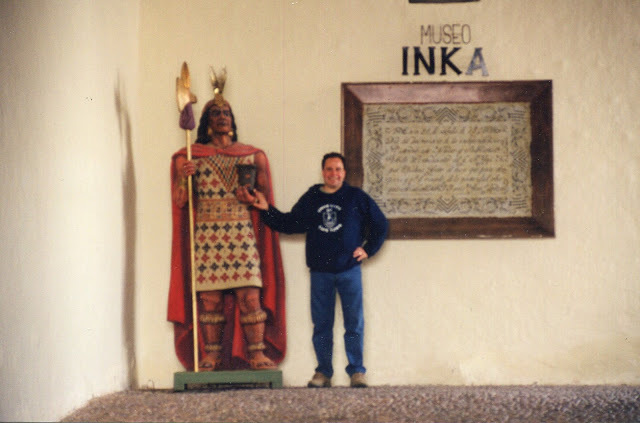 While growing up we never spoke much Spanish in the home to enable my father to perfect his English, but I was always aware of my Latin American heritage, and knew that one day I would be going there to check out the other half of my background. 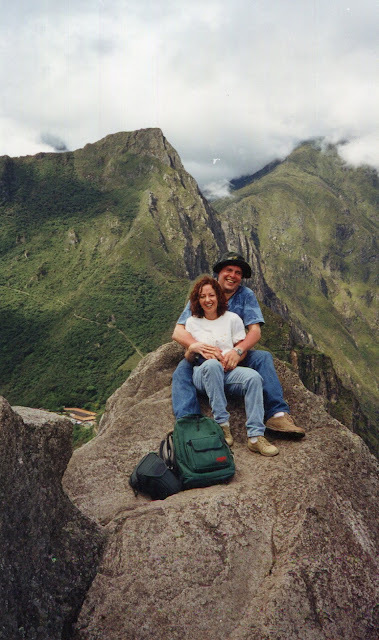 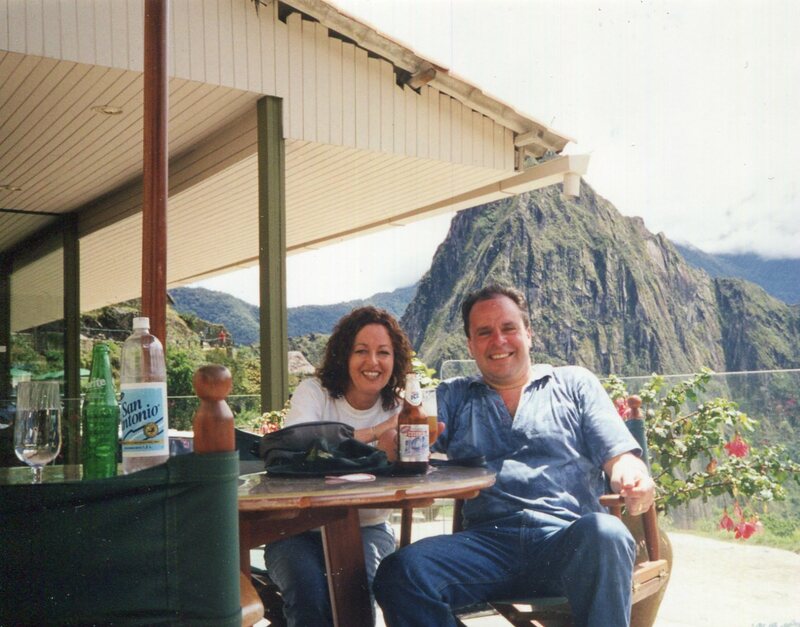 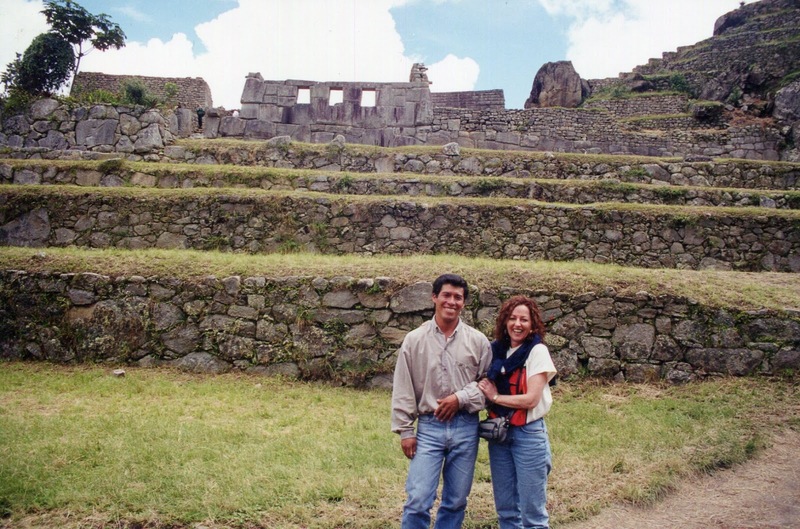 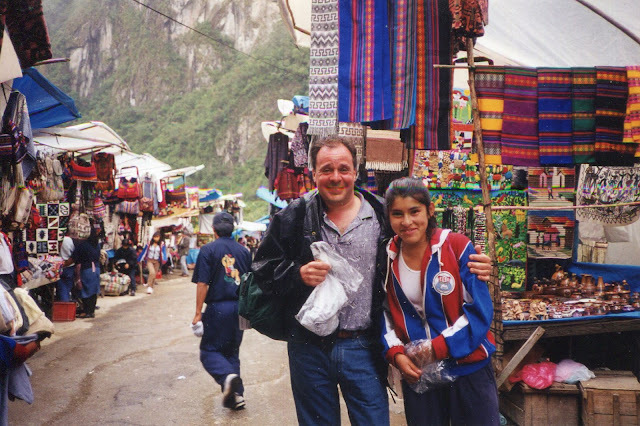 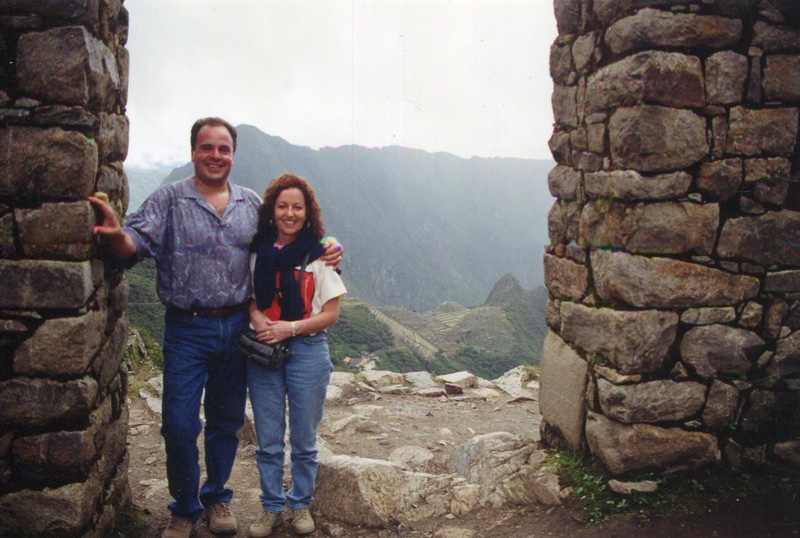 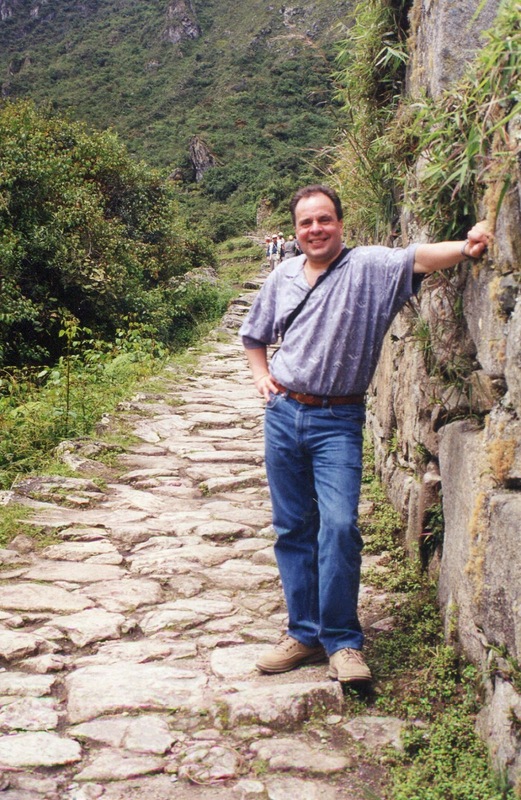 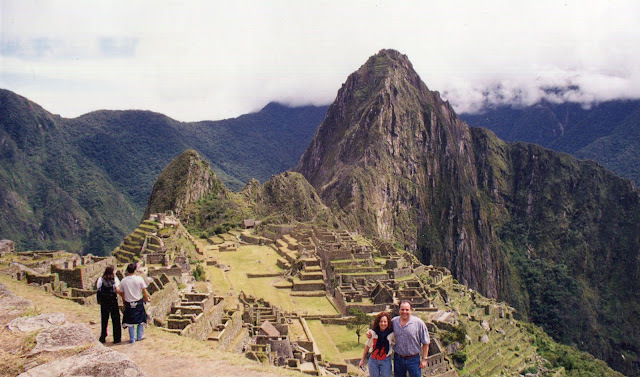 After a year or so of studying Spanish at night school, (an indispensable part of the planning) and working out an itinerary that looked like a script for the movie “If this is Tuesday it must be Machu Picchu”, my wife and I were ready for the big adventure, a one month tour of South America. 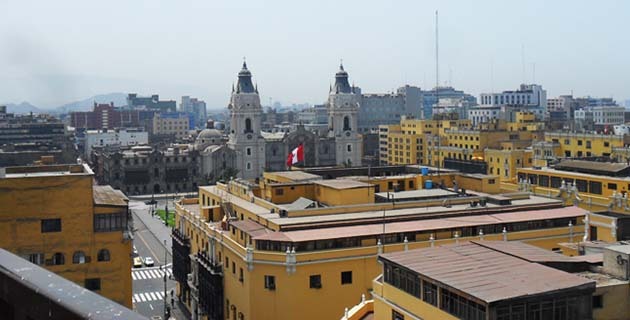 We arrived in Lima, a filthy, crowded, (population 6.5 million) rather drab capital city of Peru, full of smog, and very few redeeming cultural qualities. 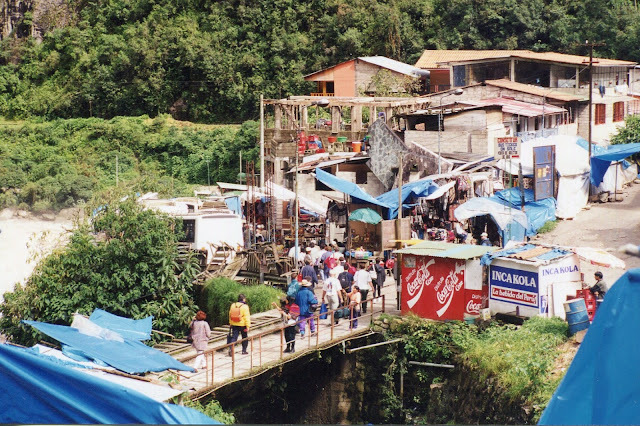 The “city where it never rains”, was supposedly once a pretty seaside place, but the massive squatter camps and influx of people from throughout the countryside have changed all that. 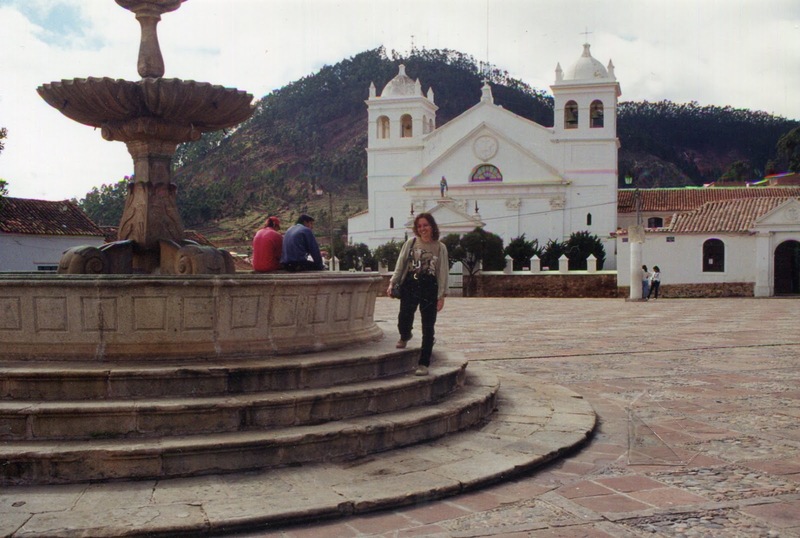 For the tourist, it's really only a place to change planes enroute to Cuzco. We had heard all sorts of dire warnings about security before we arrived but, as we discovered in every South American airport, there are plenty of “men in uniform” keeping an eye on things, and checking everyone’s baggage claim stubs to make sure nothing is carried off by the wrong person. 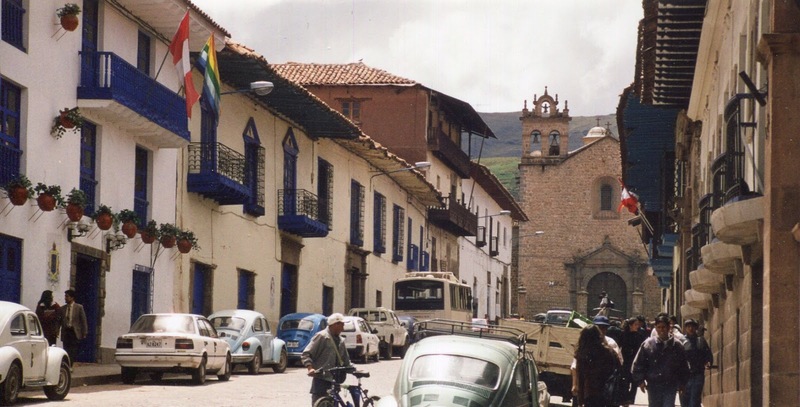 Cuzco (population 300,000) on the other hand was literally a breath of fresh air, at an altitude of 3,310 metres, (10,860 feet) the air doesn’t get much purer. 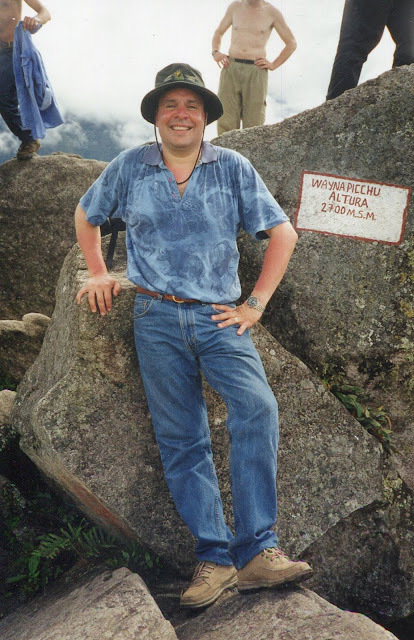 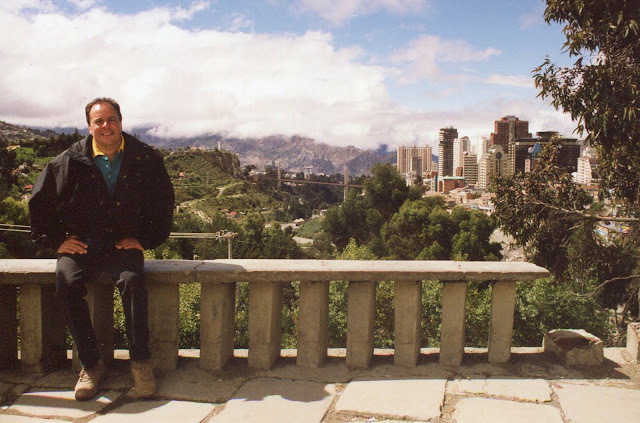 The air is also quite thin, and to avoid altitude sickness you need to have a cup of coca tea and lie down for an hour or so to give your body a chance to adjust, before going on any walks. 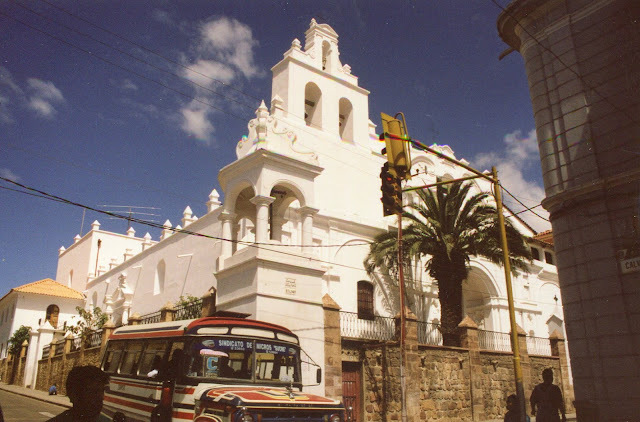 The city itself is a little jewel of Spanish and Inca architecture set in the lush green “sacred valley of the Incas”. 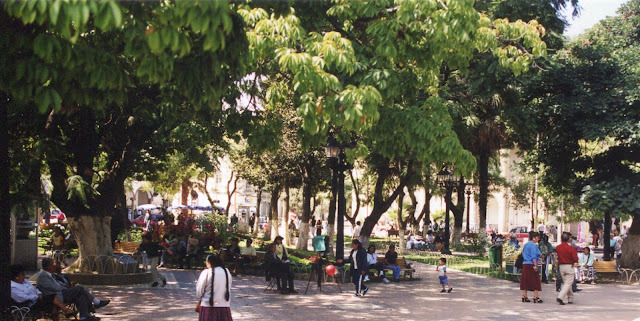 With the central “Plaza de Armas” as a reference point, many pleasant hours can be spent admiring the 17th century baroque cathedrals, browsing the side streets with their innumerable artisan shops selling beautiful alpaca sweaters, wondering at the Inca stonework which supports almost every building, or visiting one of the museums. 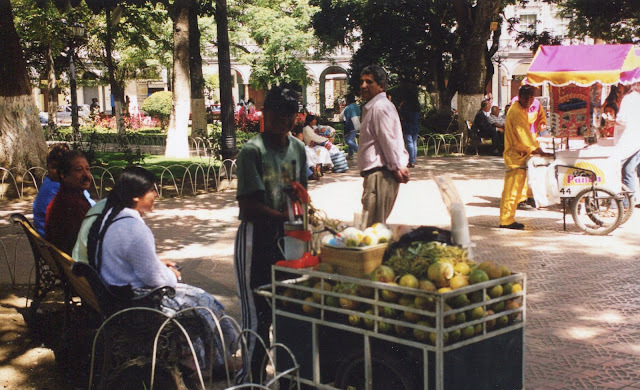 Most of the restaurants are in and around the colonial arcade which surrounds the Plaza, and it makes for a perfect people watching location as the evening comes alive. 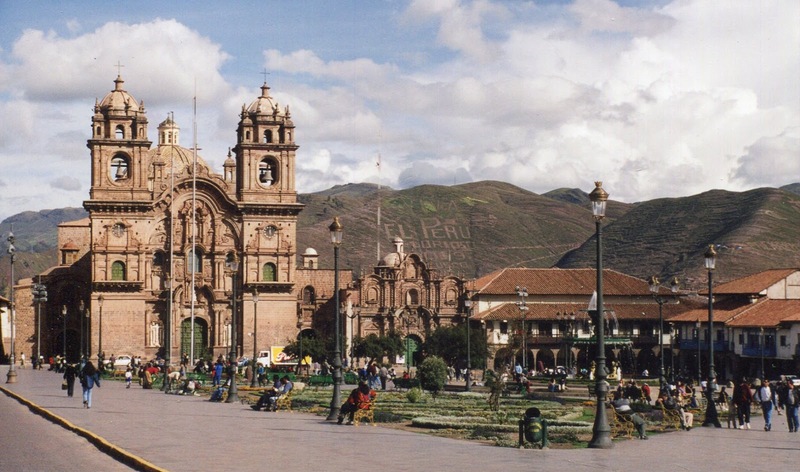 As the old capital city of the Inca empire, Cuzco today is the jumping off spot for anyone interested in a serious tour of the many surrounding ancient ruined cities, with a daily train going to the most famous of them all, Machu Picchu. 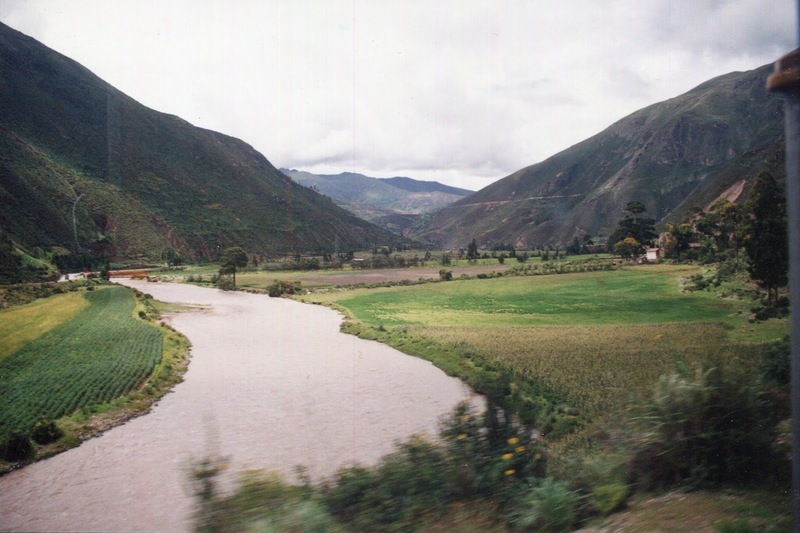 The train ride itself is quite delightful, passing through amazing examples of agricultural terrace work along the surrounding hillsides, while hooting and slowing down for all sorts of people and animals who happen to be walking along the tracks. 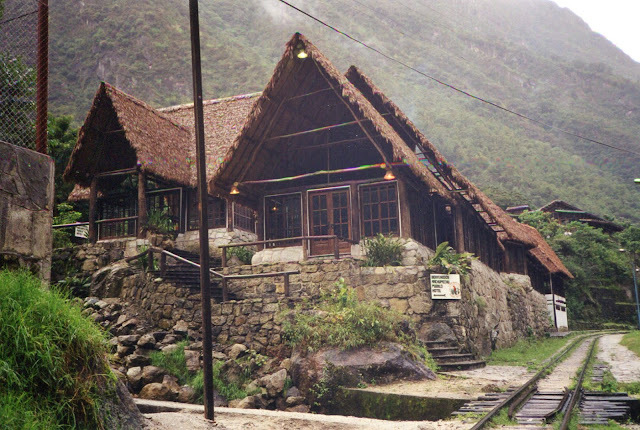 After about 3 hours we arrived at the town of Aguas Calientes, where we bunked into the Inkaterra Pueblo Hotel that also served as a sanctuary for 214 species of colourful birds. 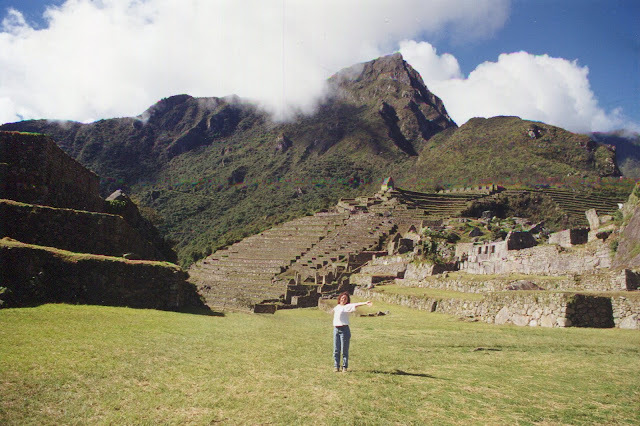 In the morning we got onto a bus for a hair-raising half hour ride along mountain switchbacks that took us to the actual site of the ruins. 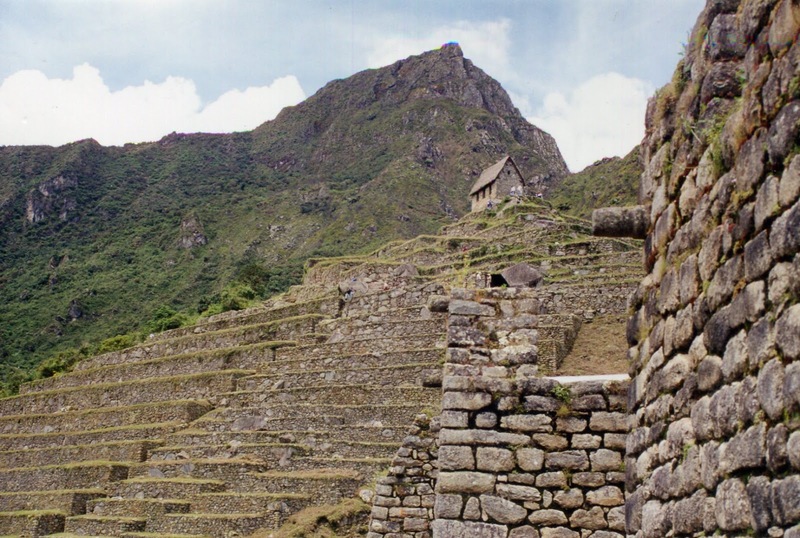 Once you get over the spectacular and almost magical setting of Machu Picchu, although you never really can, the first thing you ask yourself is why, never mind how, would anyone build in such a bizarre location? The answer is perhaps one of the most fascinating discoveries of these amazing people, and offers a whole new perspective on viewing the very visible legacy they left throughout the region. 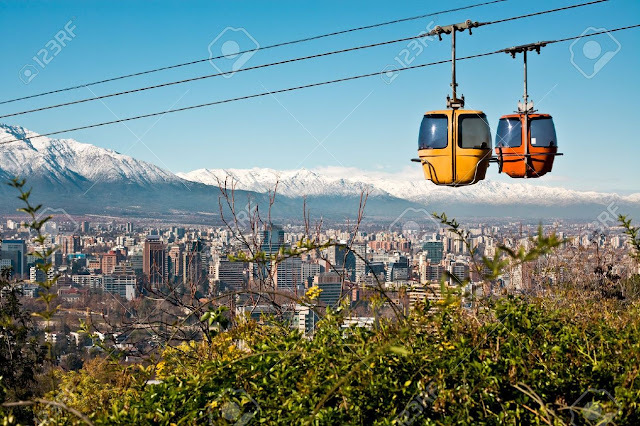 The reason they built on top of mountains is because, in an area subject to massive flooding and constant earthquakes, it was the safest place to be !!! Engineering techniques more than 500 years old allowed their buildings to be earthquake proof, and ensured the terraces had proper drainage so they wouldn’t wash away in heavy rains. Learning about this and the many other agricultural, artistic and scientific accomplishments the Inca people had made and are being rediscovered today, gave me feelings of both respect and sadness for this culture which had survived for so many centuries only to be wiped out by the greed and cruelty of the Spanish conquistadores. 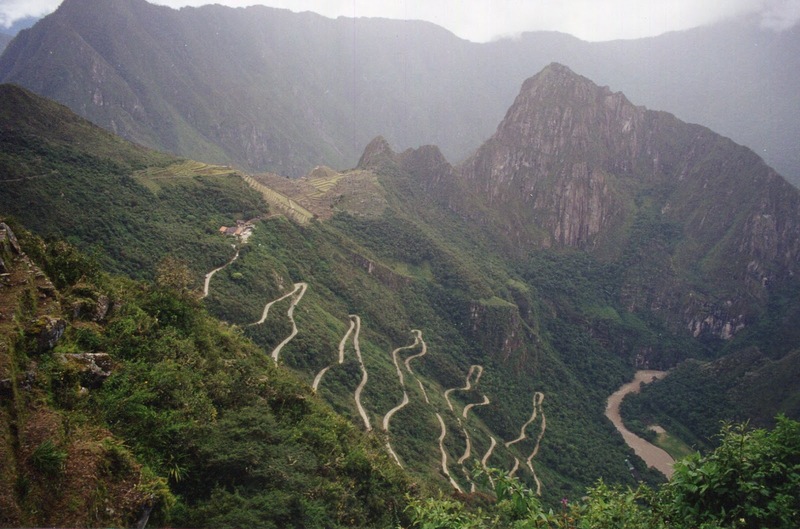 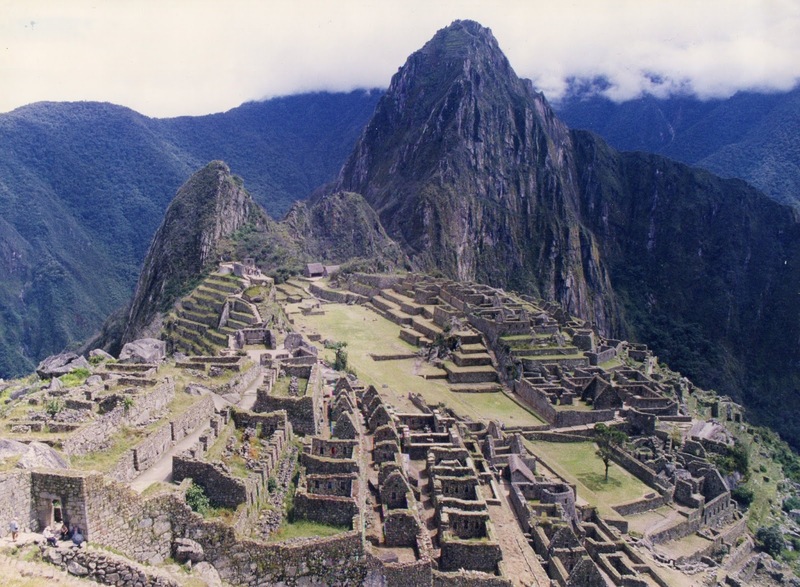 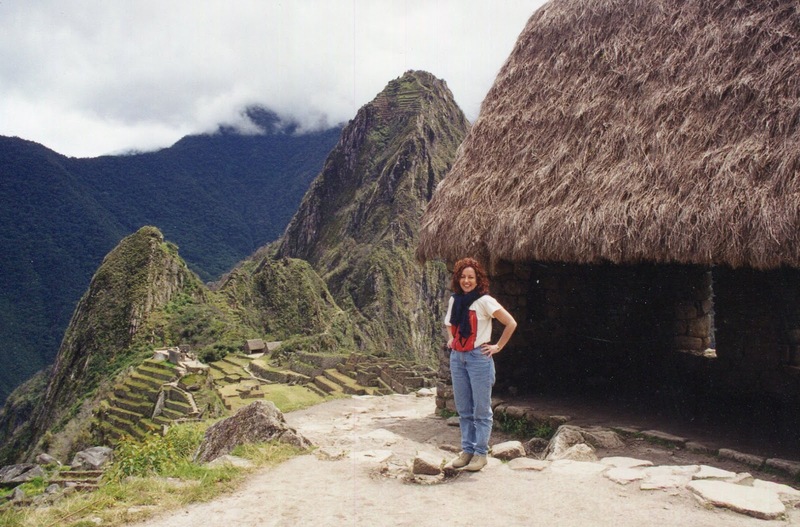 Machu Picchu is also the end of the Inca trail, a 35 km. stone walkway that starts near Km 88 of the railway line, and provides more youthful adventurers a hardy 3 - 5 day hike. 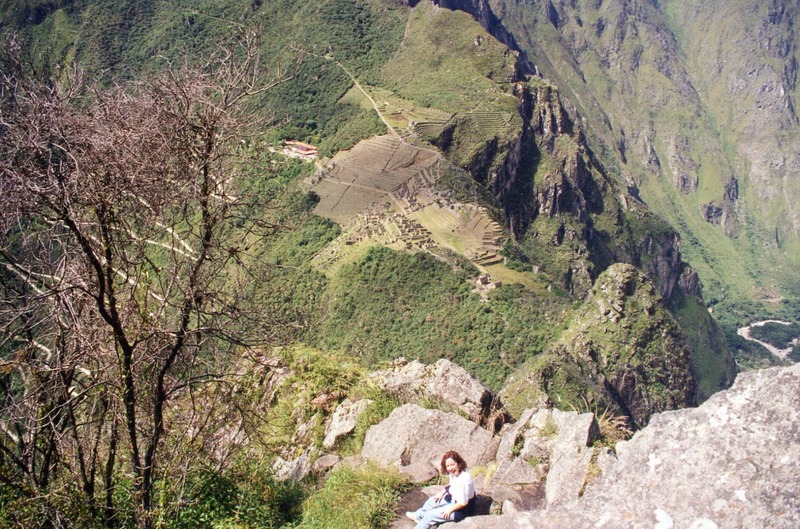 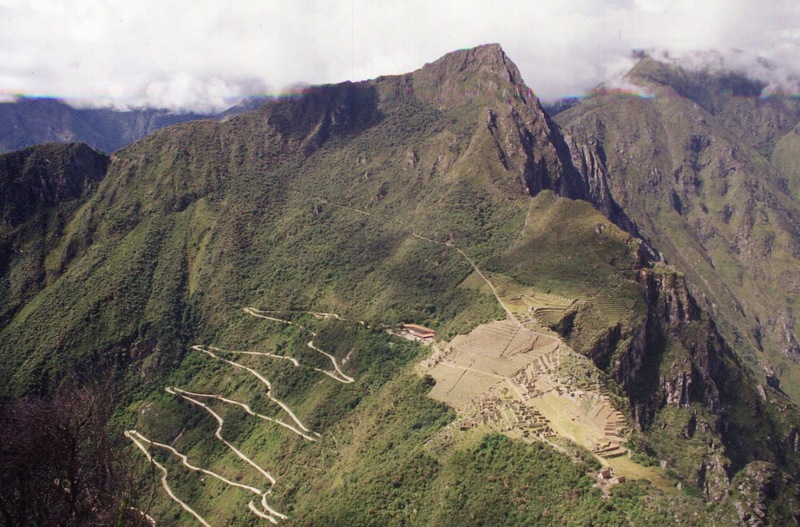 We contented ourselves with a walk back along the Inca trail to the “Gates of the Sun” and then later did the perilous but ultimately exhilarating hike up to the top of Wayna Picchu for a truly magnificent view of the entire complex. 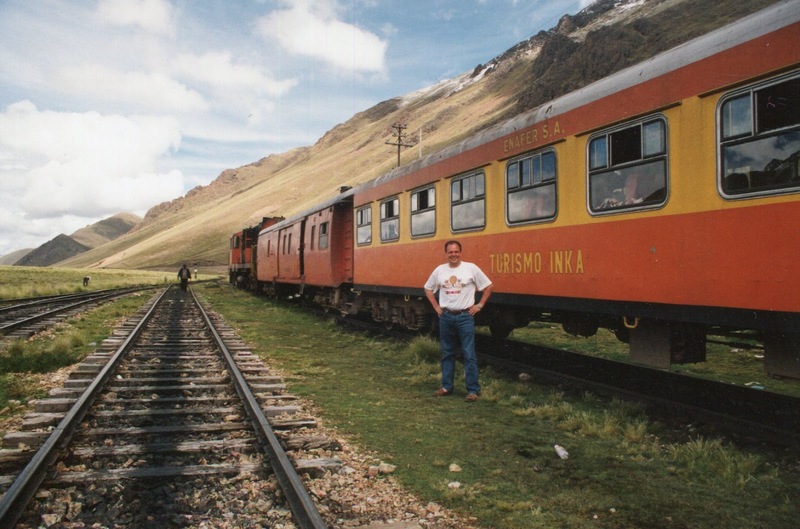 After a celebratory drink it was time to get back on the train where we continured from Cuzco to Puno, a city on the edge of Lake Titicaca, the highest lake in the world, and part of the border between Peru and Bolivia. 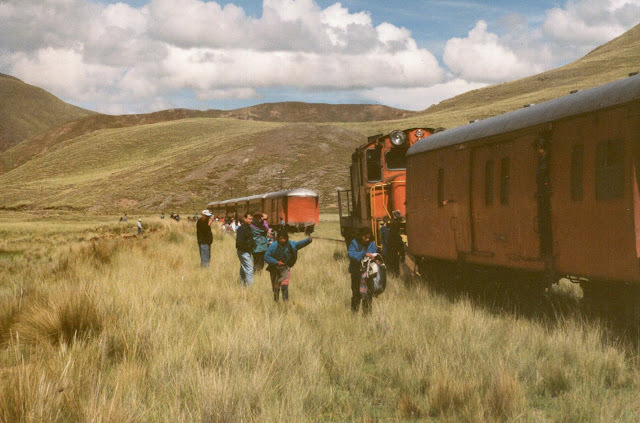 Following the Urubamba River, this train really had its work cut out as it climbed into the Andes mountains reaching at one point an altitude of 4,321 metres, (14,177 feet). The track wasn’t that well maintained and at times the ride more closely resembled that of a galloping horse, but it was a pleasant 12 hour journey through another lush green, seemingly endless valley filled with llamas, punctuated by squalid little towns, and surrounded by spectacular mountain peaks. As if needing to rest from time to time on its ardourous journey, the train made frequent stops along the way, allowing passengers to take photos and buy souvenirs & snacks from local vendors. 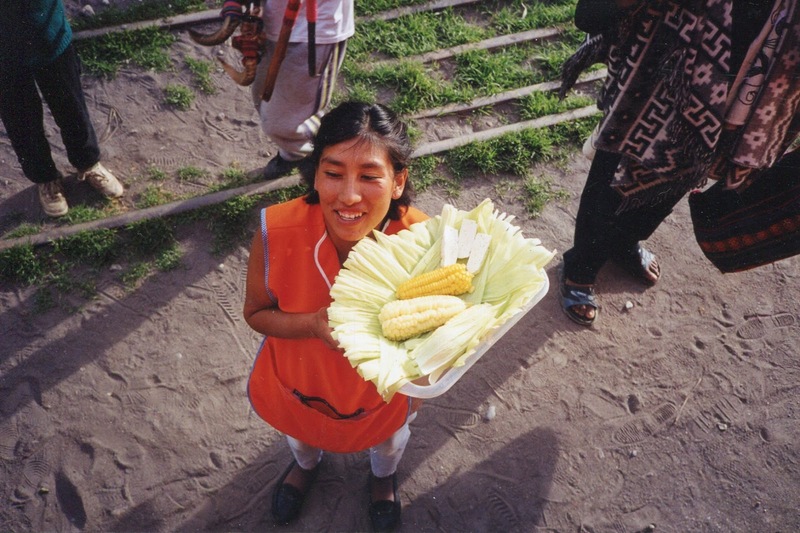 One of the tastiest items was “choclo con queso” a delicious type of corn on the cob accompanied by a piece of cheese. 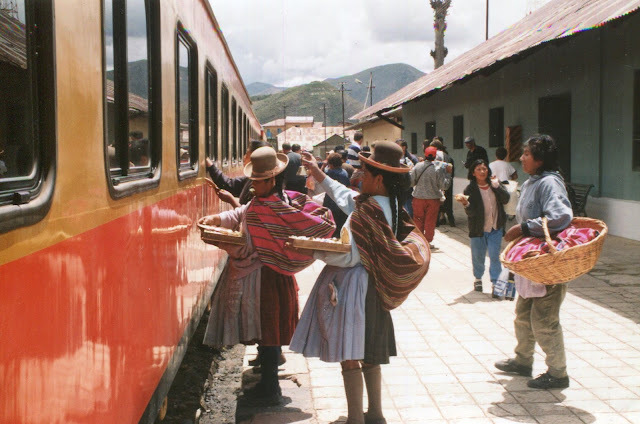 As we passed by each village, the children would wave us on and sometimes jump into the space between railcars for a free ride to the next town and a chance to sell their wares when the conductor wasn’t looking. 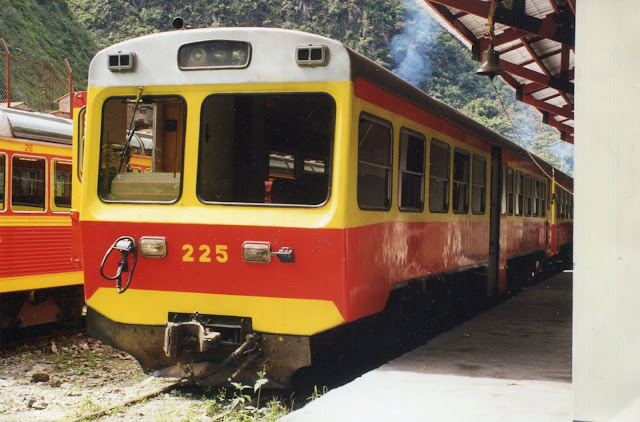 Quite an experience, and fun to occasionally share the ride with them and the sensation of being outside on a train so high up in the mountains. Puno itself was only an overnight stay before continuing on by bus to the town of Copacabana where we would catch a boat ride across the lake. 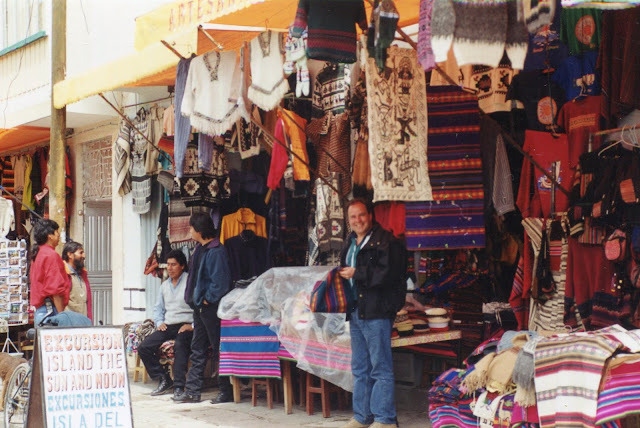 But for others, Puno is a folklore centre, famous for its floating islands and of course the enchanting highland music played by the colourfully dressed musicians of Peru & Bolivia on their unique instruments, the “quena” or reed flute, various panpipes, and the “charango” a type of miniature guitar. 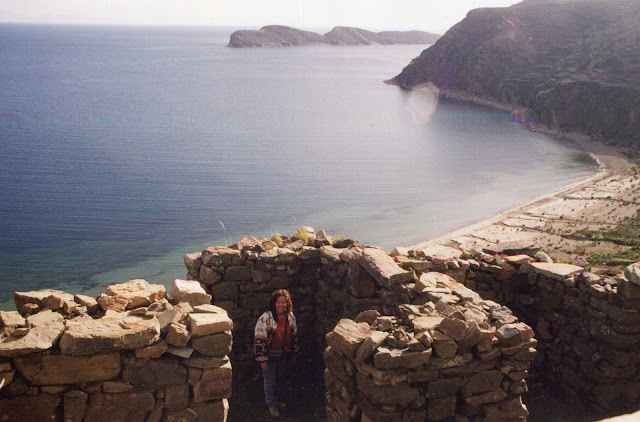 The road from Puno to Copacabana runs alongside the western shore of Lake Titicaca, a vast body of strikingly beautiful blue water reflecting the surrounding mountains, and clear, rarified air. The “gift of the gods” according to ancient legend, and a vital component of the local agricultural economy even to this day. 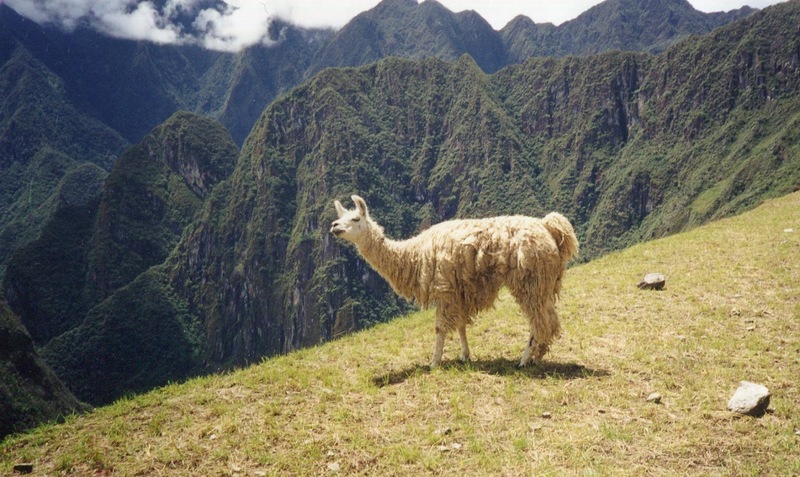 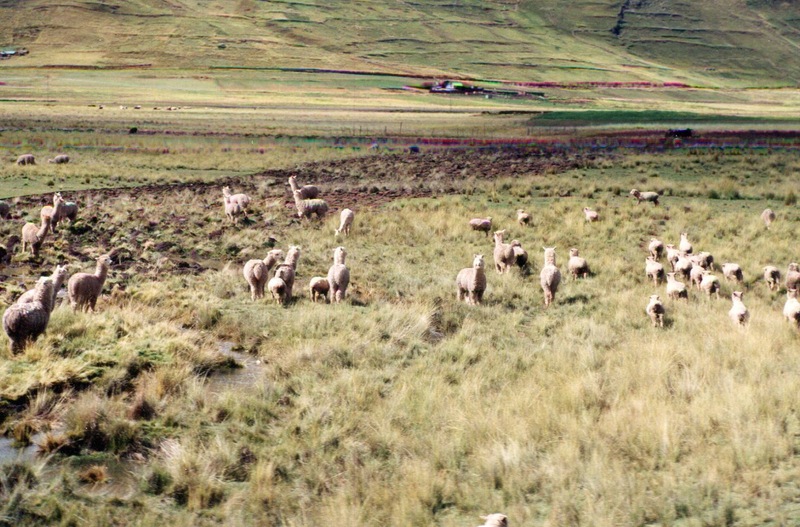 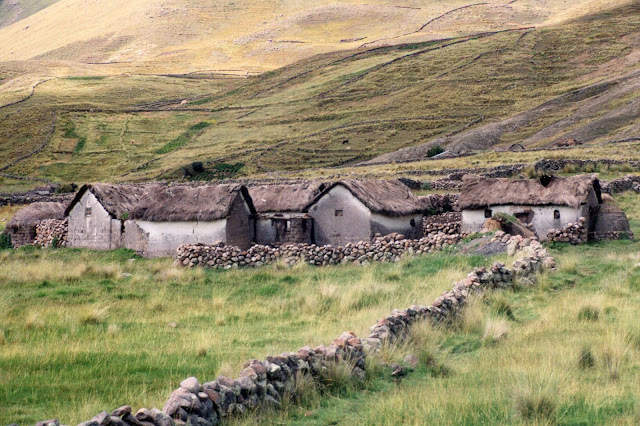 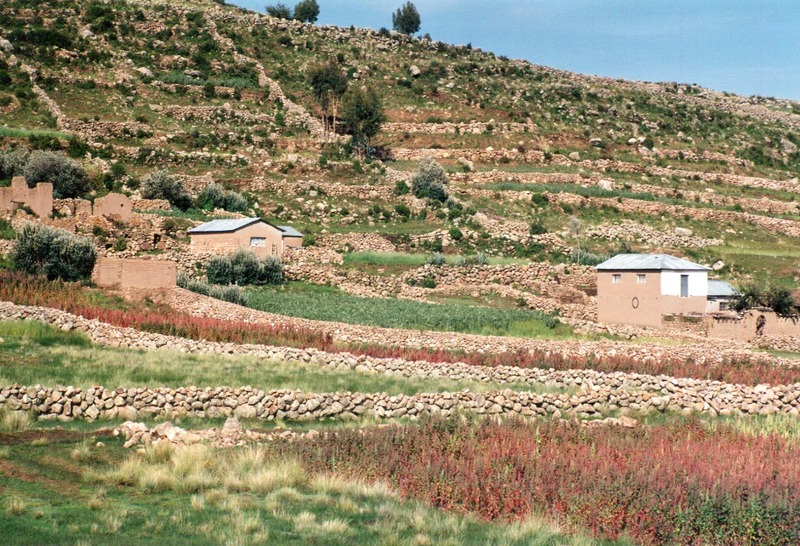 The heavily terraced pre-Inca hillsides, along with another agricultural innovation, the raised field system, are now being re-utilized by the Incas modern day descendants, the Ayamara & Quechua. 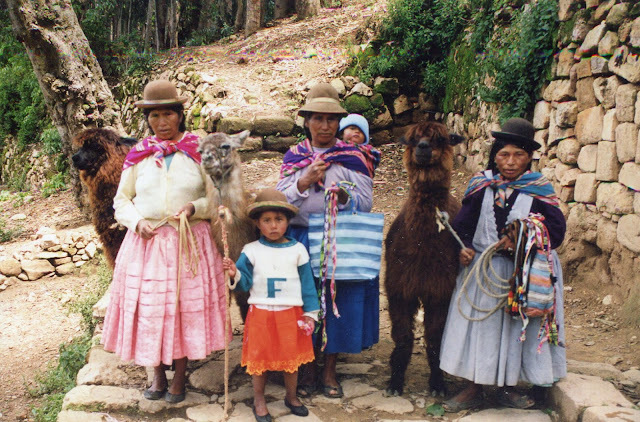 These highland Indians, or campesinos, with their characteristic bowler hats, colourful shawls & multi-layered petticoats make up the vast majority of the population in this region. 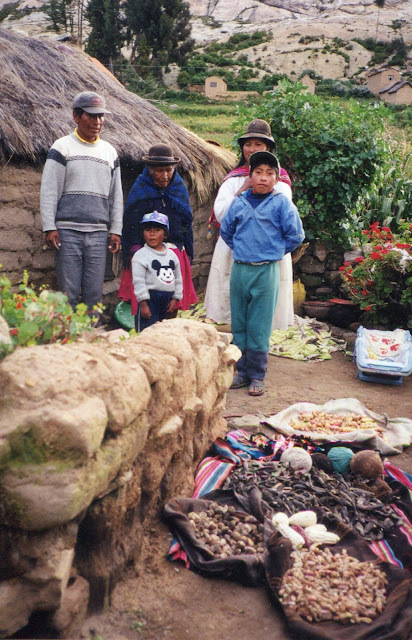 Living in adobe huts, and tending small plots of land, they eke out a subsistence existence far removed from modern concerns, but one that grants them a peaceful self-sufficiency in spite of their very harsh circumstances. 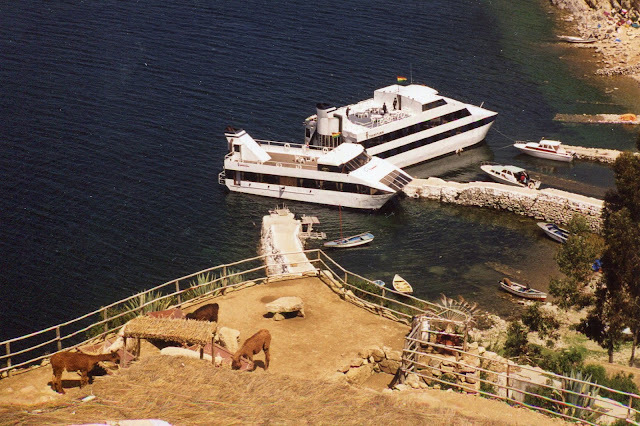 On our overnight catamaran trip across Lake Titicaca we stopped at the “Isla del Sol”, the birthplace of the first Incas according to their creation legend. 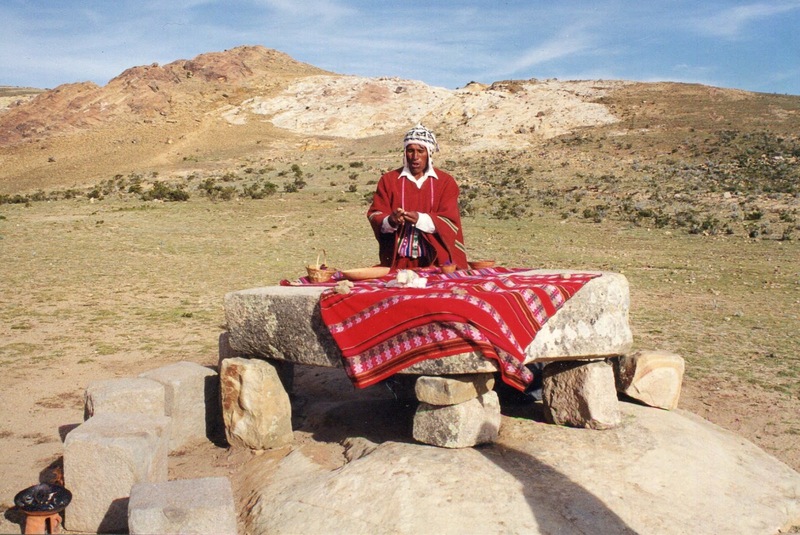 Here we had an opportunity to see the people close at hand, and participate in a moving “Pacha Mama” or earth goddess ceremony conducted by the local “Kallawayo”, a sort of combination medicine man and fortune teller. 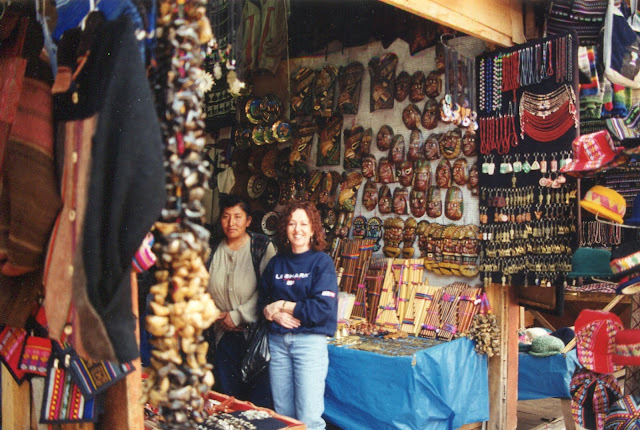 Interesting carved figures of the “Pacha Mama” are widely available, and they depict her many faces of love, as well as the turtle, which represents health, the snake, for protection, and the frog, for money, which are her other responsibilities. 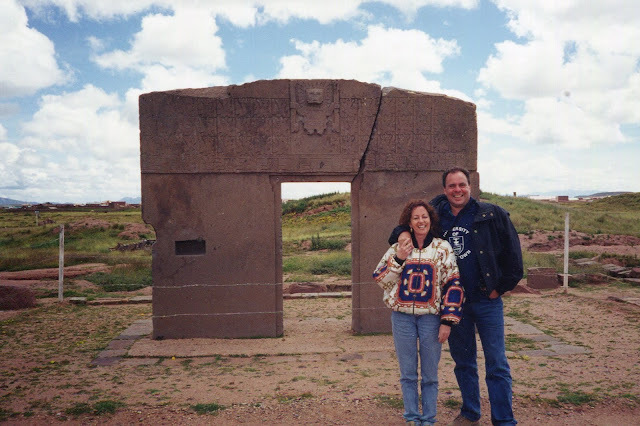 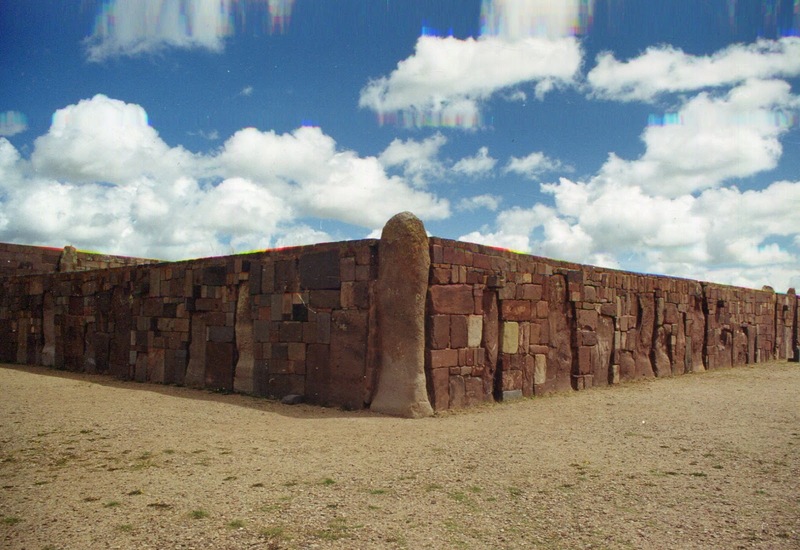 To finish our tour of Inca civilization we visited the ruins of “Tiwanaku”, an ancient metropolis going as far back as 1200 BC, that stands in the middle of the “altiplano” or highland plain, 3,846 metres (12,619 feet) above sea level, on the southern edge of Lake Titicaca and just outside of La Paz. 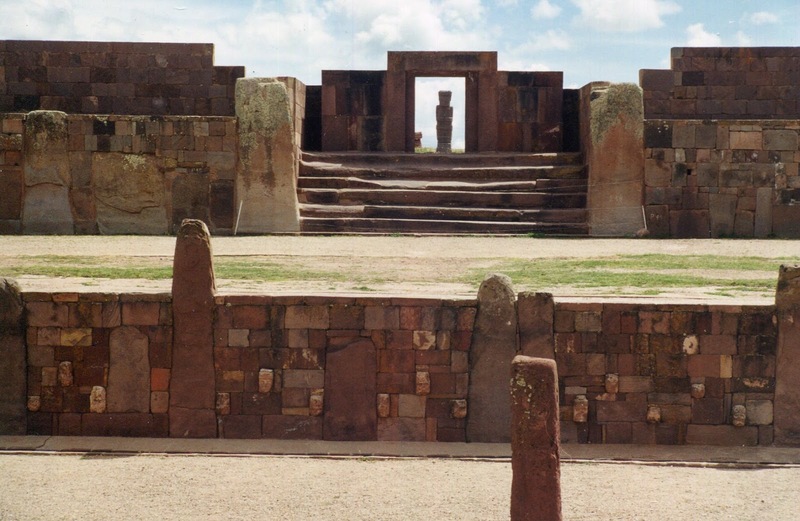 Standing amid intriguing stone monoliths whose representations are still a mystery, we again admired the amazing precision that went into constructing the walls & temples, the agricultural ingenuity used to overcome the harsh climate, and the intricate carvings of the calendar depicted on the “Gate of the Sun”. 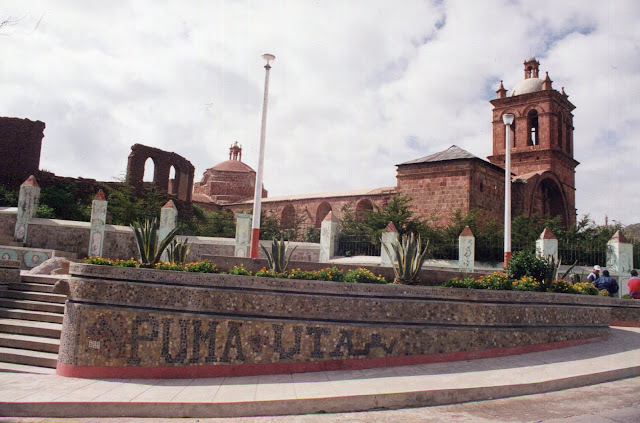 In the many fascinating examples of ceramics on display, we also gained an appreciation of their old religion which symbolized responsibility for the sky, earth and underground in the condor, puma and serpent. 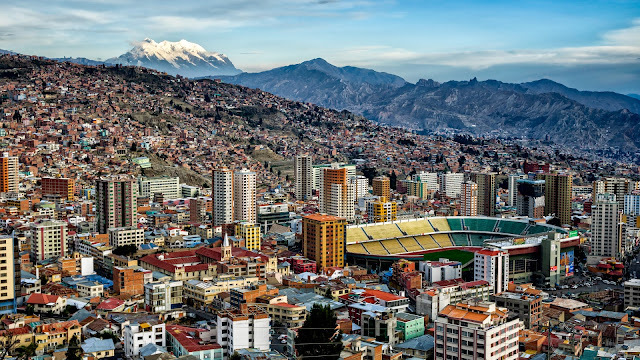 Arriving in La Paz, the capital of Bolivia, and at 3,336 metres (11,930 feet) the highest capital in the world, we said goodbye to the altiplano and plunged into a city of 1.5 million built around a rapidly descending canyon. 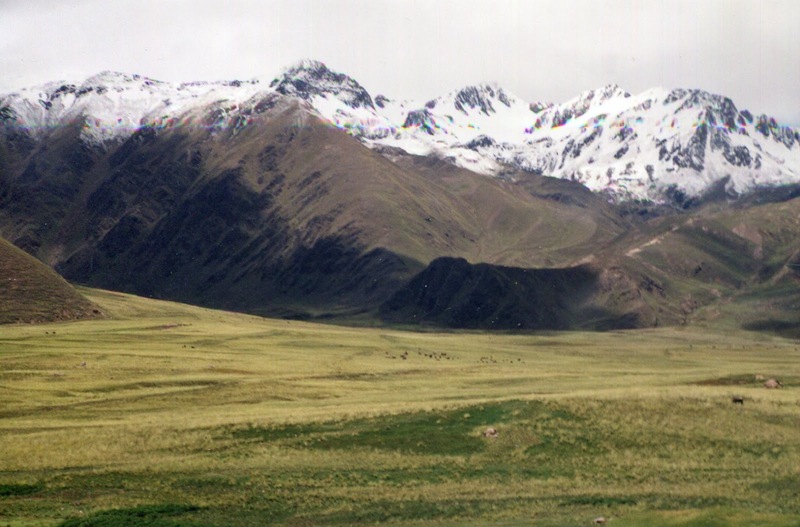 A very dramatic setting, highlighted by Mt. 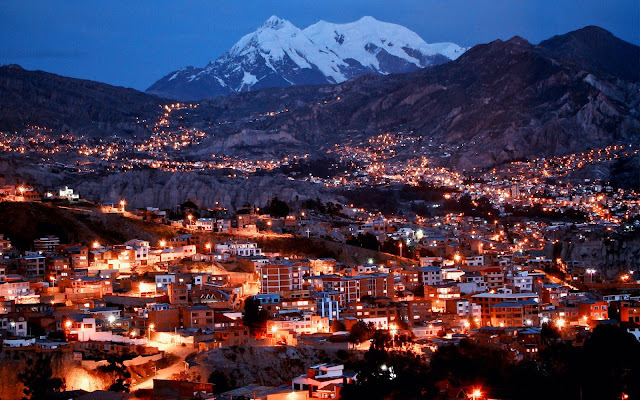 Illimani, which at 6,439 metres (21,126 feet) towers over everything. 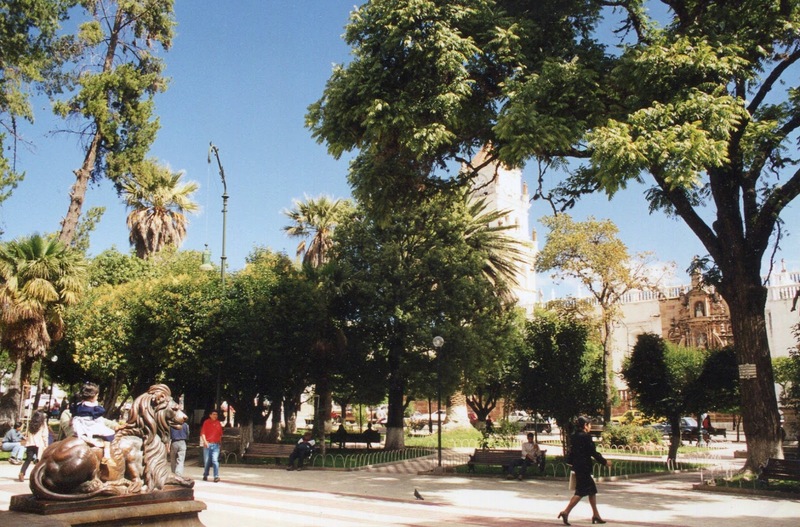 The principal street, known as the “Prado”, runs through the centre of town from the Plaza San Franciso to the Plaza del Estudiante. 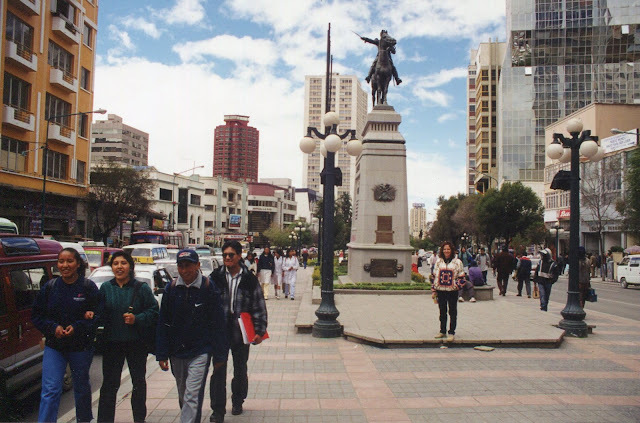 Lined on the outside by high-rise buildings, the middle of the street contains an elegant tree-lined pedestrian boulevard dotted with fountains and statues that makes for a very pleasing walk. Because of the high altitude, La Paz is probably the most difficult city to breathe in, but once you adjust, it offers a rewarding variety of places to visit. 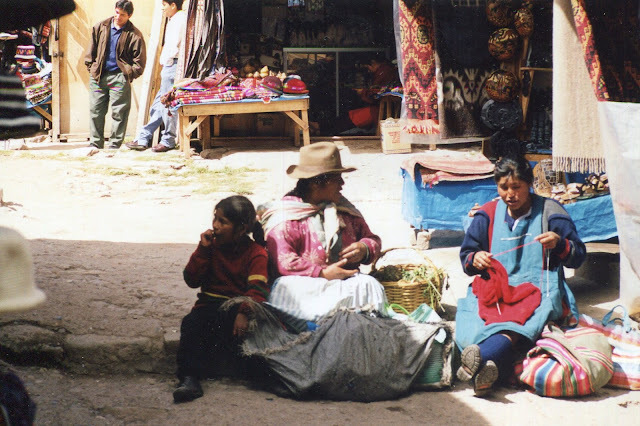 Especially worthwhile are the museums, with their displays of Inca treasures, and of course the fascinating and very reasonably priced artisan markets filled with intricate gold & silver jewellry, colourful woven fabrics, pewter, wood & leather products, and beautiful alpaca sweaters, all displaying the signature Andean design. 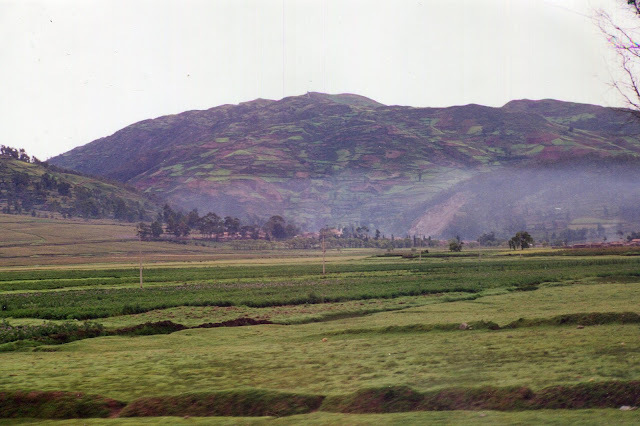 Surrounded by the lively cacophony of buses, traffic, and people everywhere on the move, it was difficult to imagine the rural tranquility we so recently left behind. 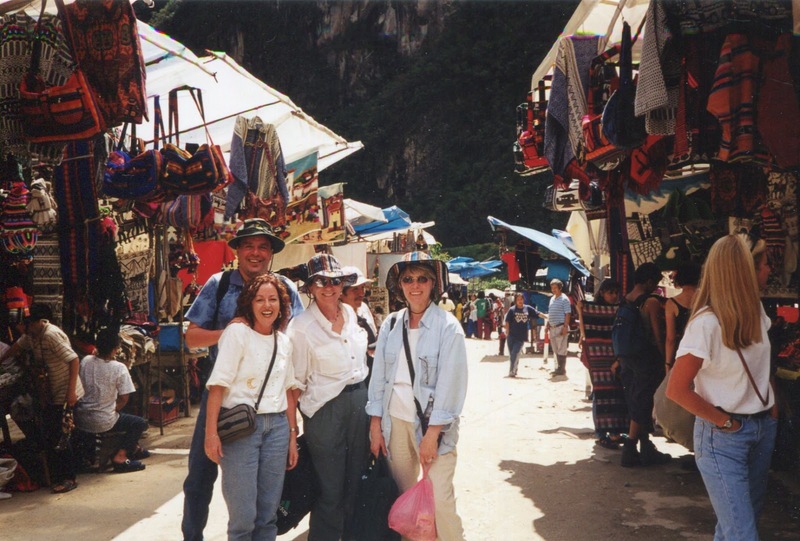 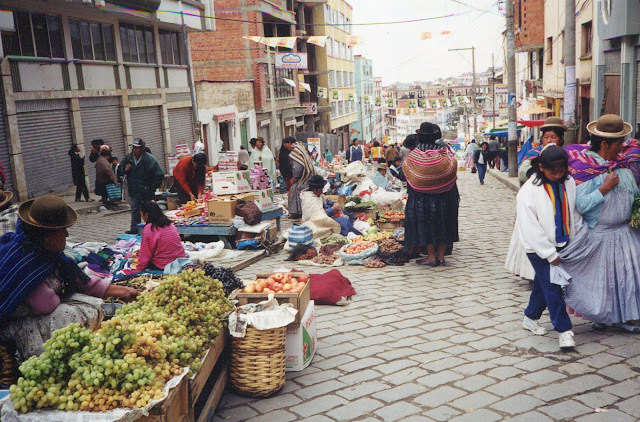 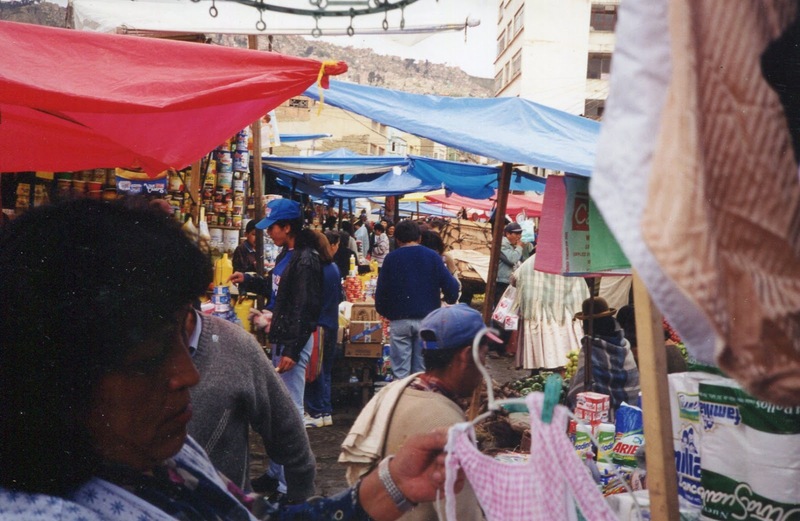 But then stumbling into the “Mercado de las Brujas” or Witches Market, we once again encountered the colourful local Ayamara and Quechua women who were selling their produce and other goods, such as the indispensible coca leaves, in makeshift stalls along the streets. Perhaps more than anywhere else in the Andean region, La Paz demonstrates the contrast between the modern world and an ancient culture that is still very much alive. 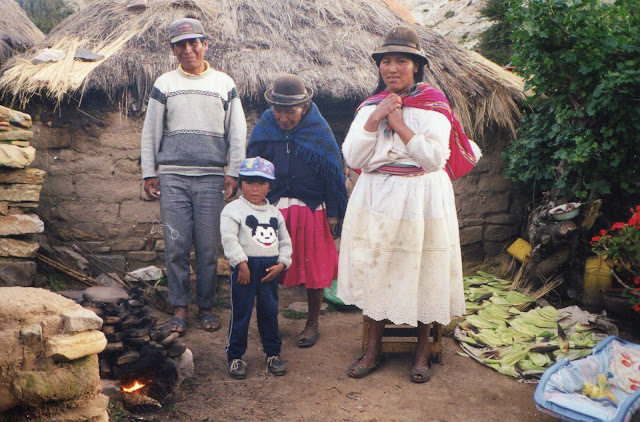 On the one hand the inability of the country to move these rural people into a modern economy is hindering its development, yet it is the glory of their past, as represented by these campesinos, that will hopefully be the spark to ignite their future. 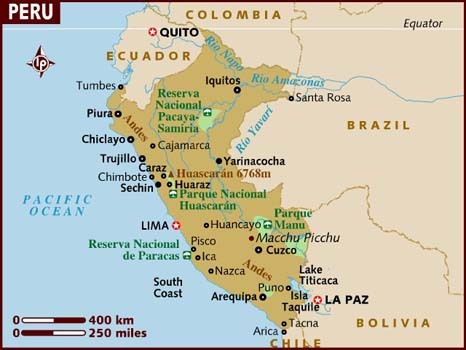 It took nearly 300 years to rid Bolivia and Peru of their hated Spanish overlords, only to see them replaced by a new ruling class of “mestizos” or mixed Spanish/Indians. The modern day Inca descendents who make up the vast majority of the population are still waiting to reclaim their rightful place in society, but perhaps as a reflection of their own peaceful nature, they don’t seem to be in any particular hurry. From the high mountain peaks of the Andes to the windswept plains of the altiplano, the intriguing ruins of their former empire bear witness to a culture we are only now beginning to appreciate. 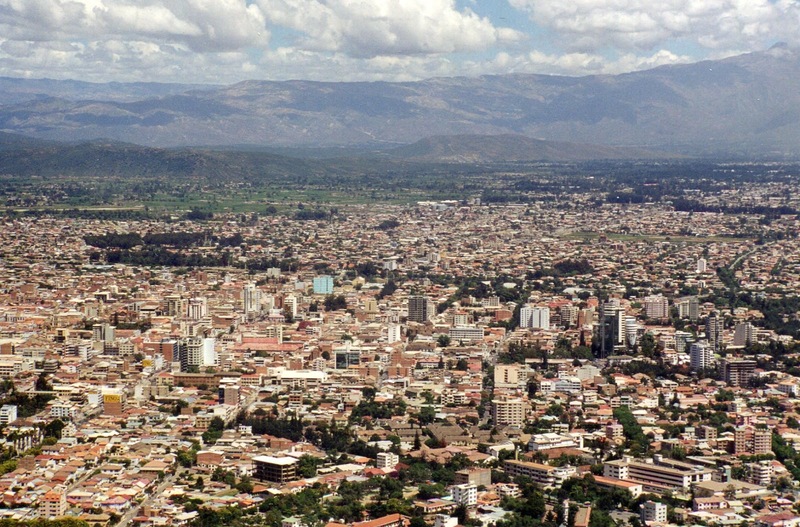 Our next stop in Bolivia was Cochabamba, a delightful small city (population 300,000) located in the foothills of the country, where the average temperature was 18 C and the streets were lined with palm trees. 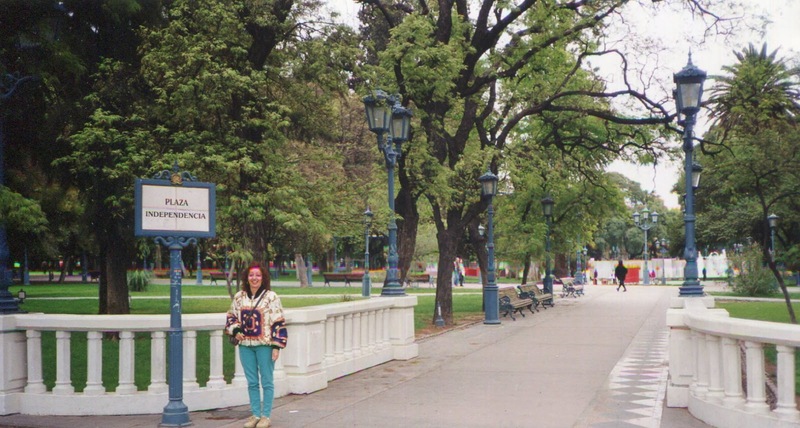 The air was noticeably easier to breathe now that we were at a lower elevation, and we wasted little time getting out for a walk amongst the lovely plazas and boulevards. 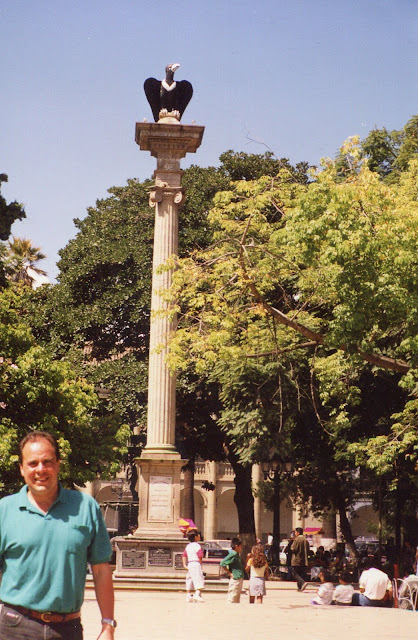 One of the most striking things in any South American city is the local “plaza” or park which is usually named after the city’s date of independence. 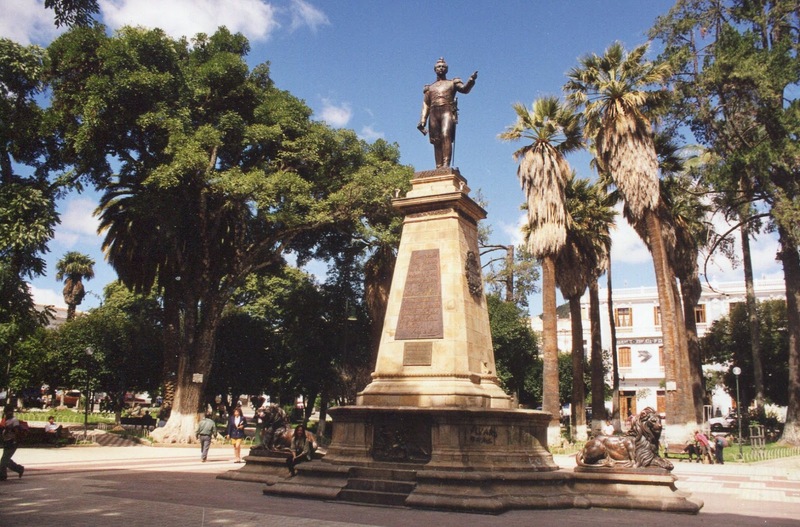 South Americans are fiercely proud of their independence, and no matter how poor or shabby the town, there will always be a beautiful “Plaza de Independence” or “Armas” in the centre that is filled with shade trees & benches, has at least one fountain, and of course a magnificent statue of either Simon Bolivar or San Martin. 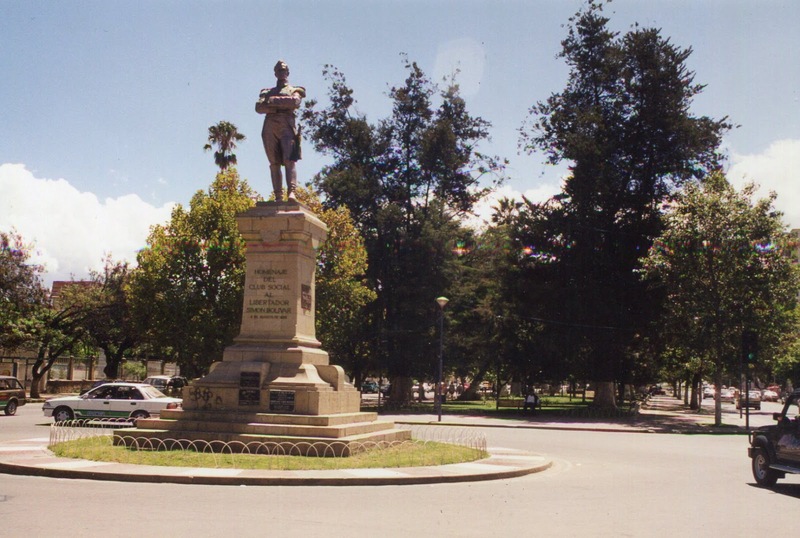 In addition to the traditional plaza, Cochabamba also has a “Prado” that is twice the length and width of the one in La Paz. 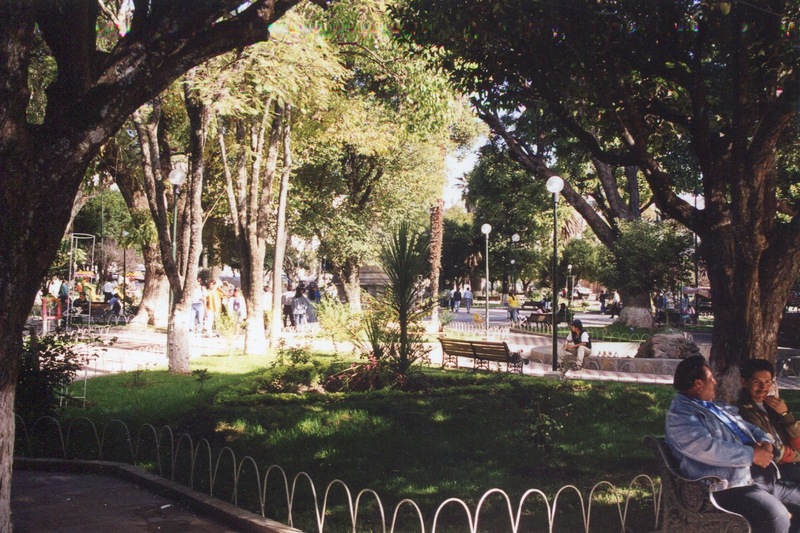 Lined with lovely trees and spotless sidewalks, each of the principal intersections contained a fountain or statue, while cafes and restaurants were clustered in the area where the “Prado” began. 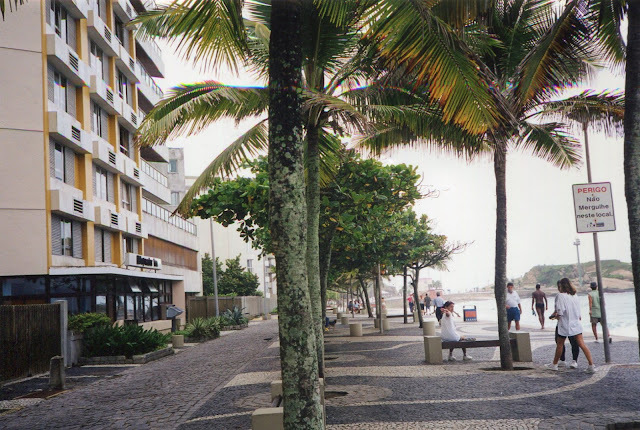 A wonderful place for a stroll, and in the evenings the young people can be seen walking up and down the strip while others are cruising by in cars, in a scene right out of “Happy Days” or “American Graffiti”. 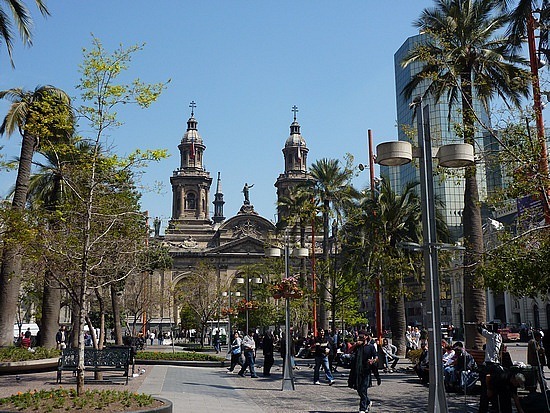 South Americans of course are devout Roman Catholics, and in every city there is always at least one magnificent 17th century Cathedral that is a testament to their faith. If there is a hillside nearby with good visibility for the rest of the town, there is often a large statue of Christ that has been erected. 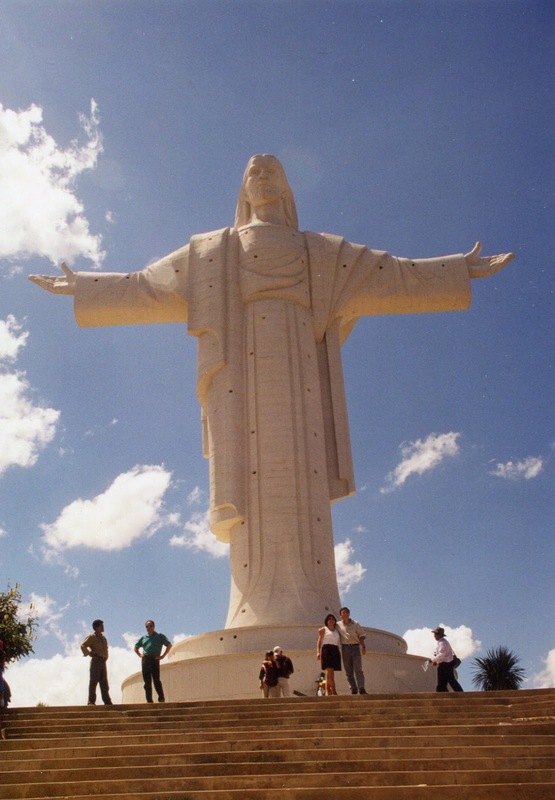 In the case of Cochabamba, the multi-storey statue of “Cristo de la Concordia” is larger even than its more famous counterpart in Rio de Janeiro. 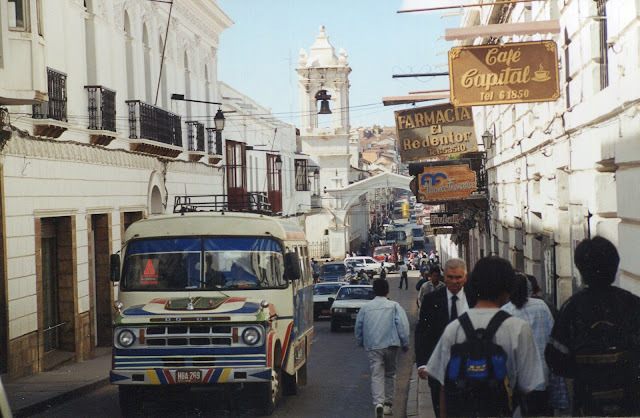 We also took a day to visit the old colonial capital of Sucre, a charming little city (population 150,000) that is also known as “La Ciudad Blanca” because all the buildings are painted white. 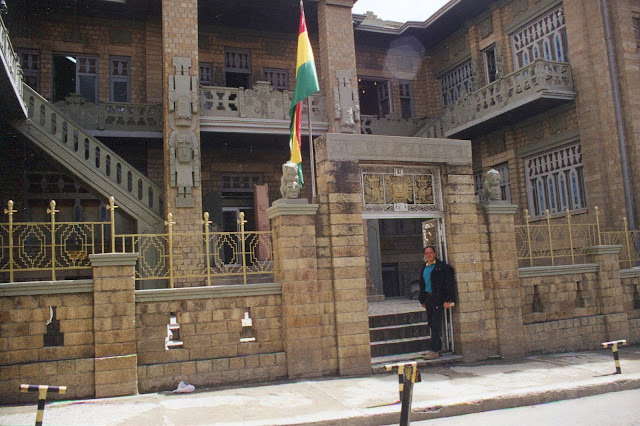 Somewhat isolated from the rest of the country, it has preserved a unique old world style that has earned it an historical & cultural declaration by the UN. 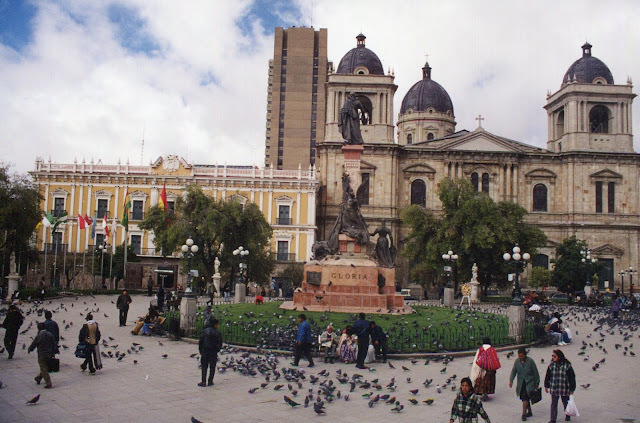 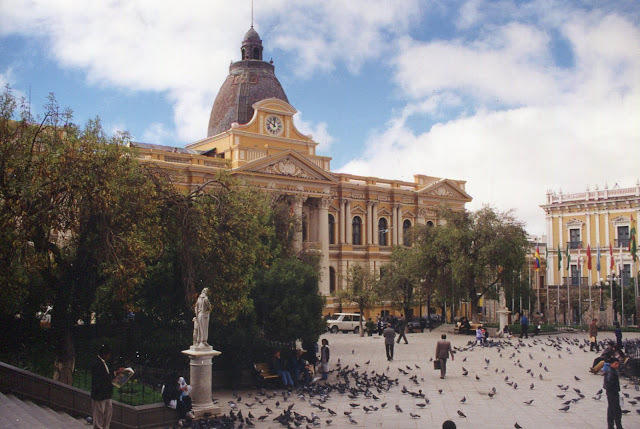 It has the most magnificent plaza in all of Bolivia, the “Plaza 25 de Mayo” which is filled with enormous shade trees and heroic statues, criss-crossed with mosaic footpaths, and surrounded by elegant buildings, that include an arcade, and a Cathedral. 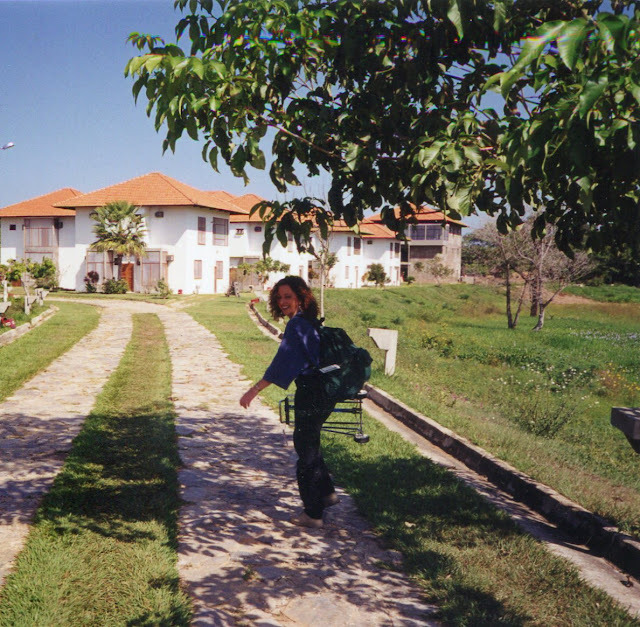 Sucre was also the place where I had the opportunity to experience the difference in our country’s medical systems. 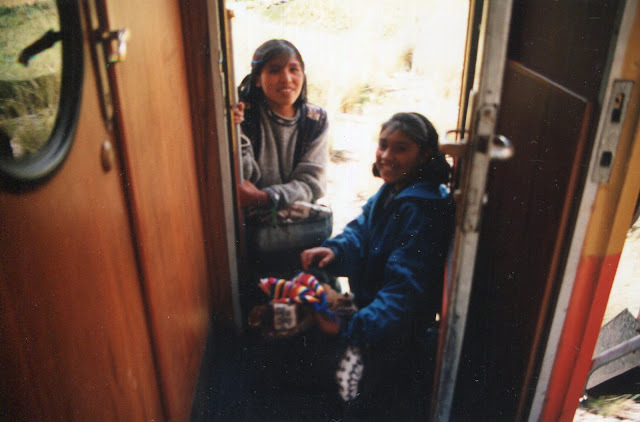 By leaning against the outside of the train car on the trip from Cuzco to Puno, I had severely bruised my tailbone, and the excruciating pain had now caught up to me. 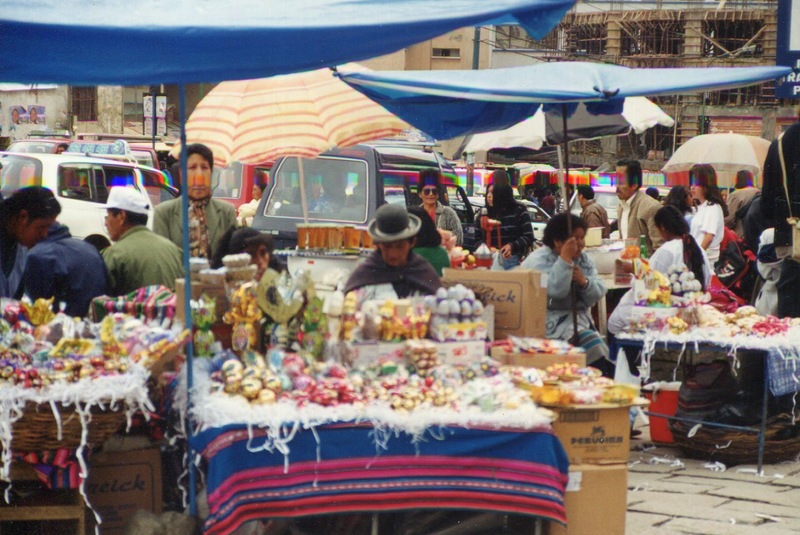 You don’t need a prescription to purchase drugs from the pharmacies in Bolivia, but if you don’t really know what you need, all the painkillers in the world aren’t going to solve the problem. 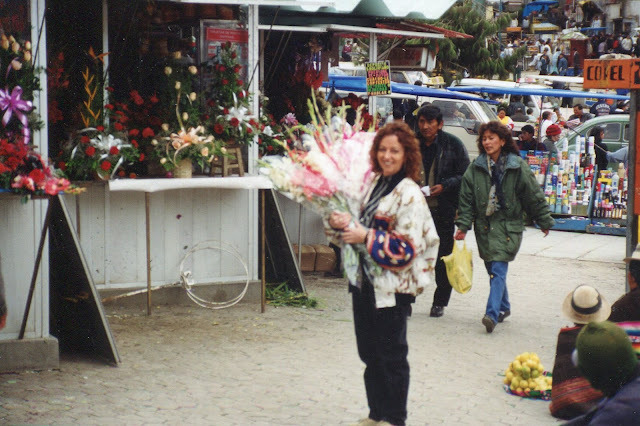 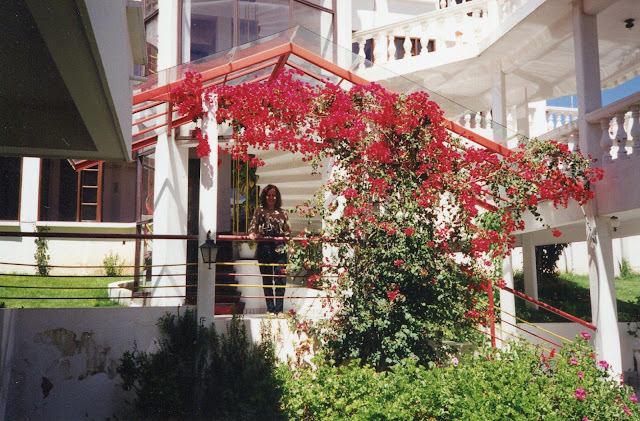 But at the outdoor, drop in clinic of the Santa Barbara hospital, a quick inspection and a muscle relaxant injection into my buttocks, all of which took place in plain view of everyone else in sight, solved all my problems for a cost of only two dollars. A little loss of dignity was a small price to pay for such prompt and efficient service, and after freshening up at our bougainvillea infused hotel we were able to go out and enjoy a wonderful meal of "saice" and "silpanchos" a couple of the local specialties. 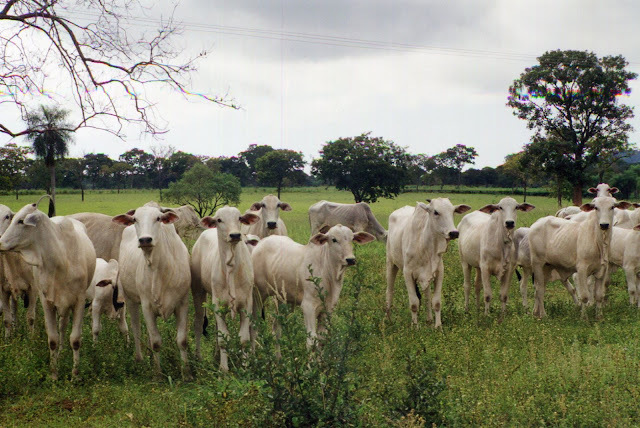 It was now time to leave the gentle folk in Bolivia and visit the more rowdy neighbours in the awakening industrial giant of Brazil. 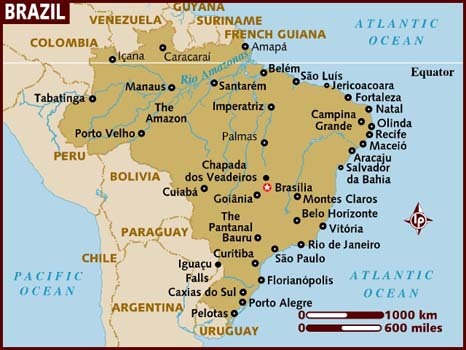 Brazil shares a border with just about every other country in South America, yet is the only place that doesn’t speak Spanish. 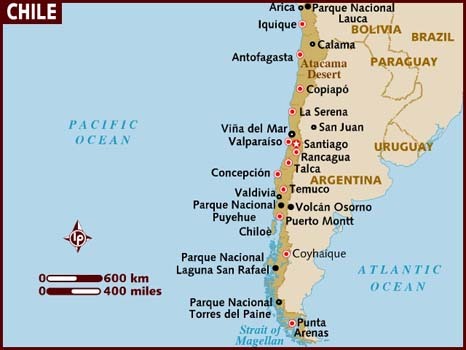 This, more than anything else, seems to set it up as everyone’s friendly rival and, with almost half the land mass and population of South America, it is determined to prove it is bigger and better than the rest of the continent combined. 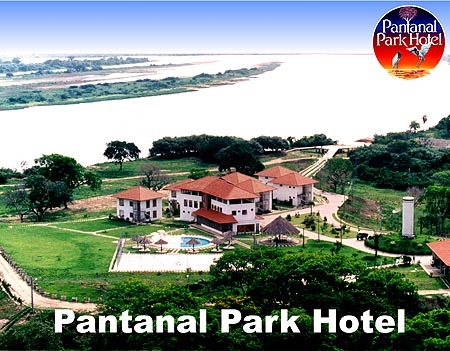 This is no idle boast, as the massive infrastructure projects being undertaken practically everywhere will testify, but there is one part of Brazil that has remained relatively untouched up until now, and that is the area known as the “Pantanal”. 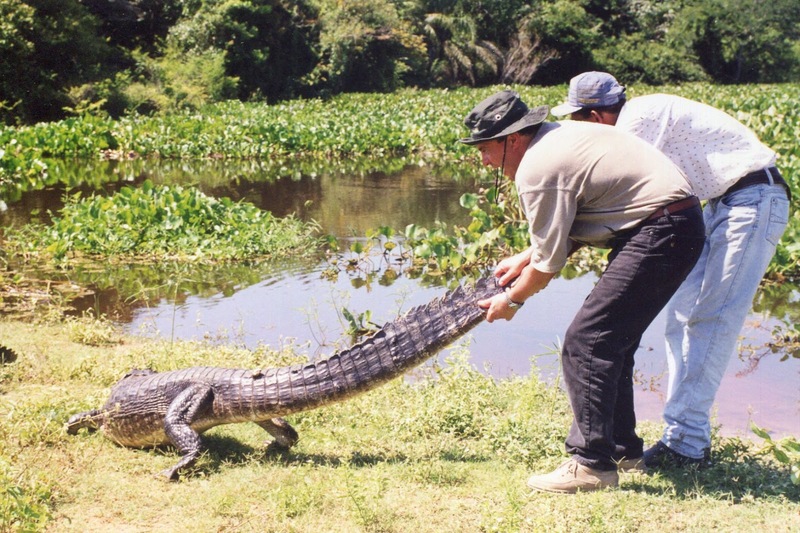 The Pantanal is a vast ecological wetland of 230,000 square km. 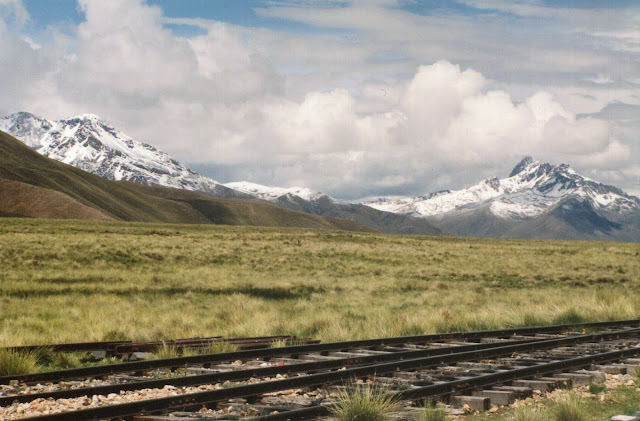 between Campo Grande and the Bolivian frontier. 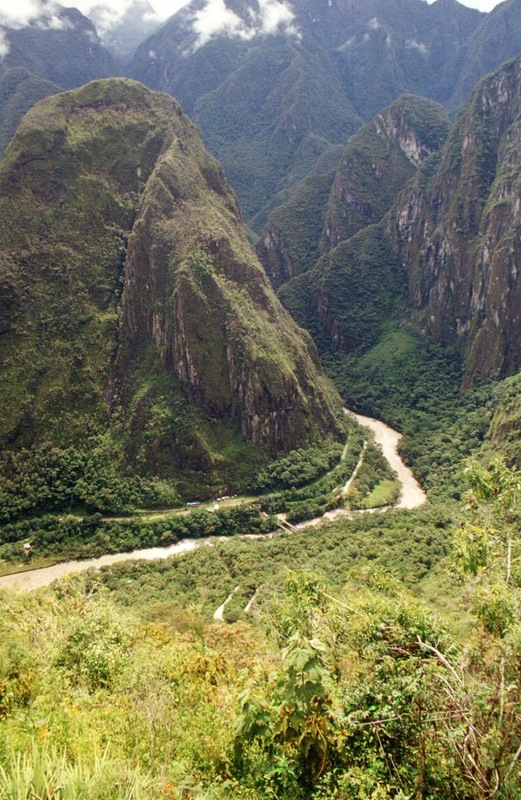 Considered one of the world’s great wildlife reserves, and indeed the world’s largest, it is only now being discovered by the tourist industry. 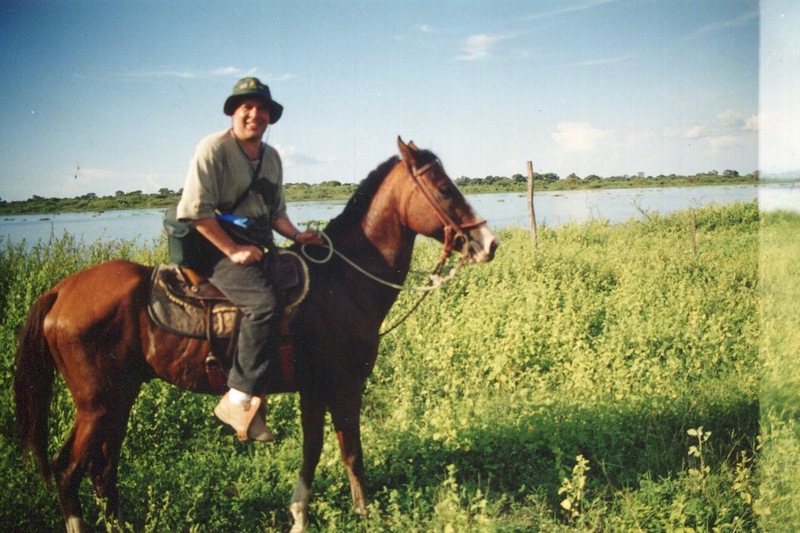 The best way into the Pantanal from Bolivia is through the humid & muggy little smuggler’s town of Corumba. 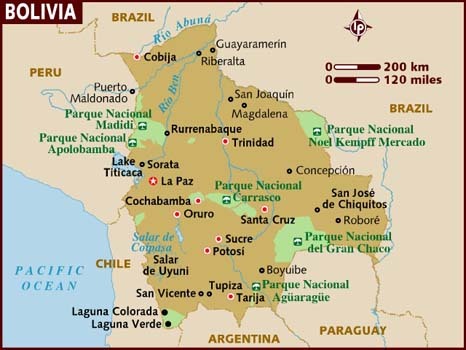 Corumba, however, is not an international airport so we flew to Puerto Suarez, which is on the Bolivian side of the border, and then took a 10 minute taxi ride the rest of the way, stopping enroute to wake up the border officials of both countries to get our passports stamped. 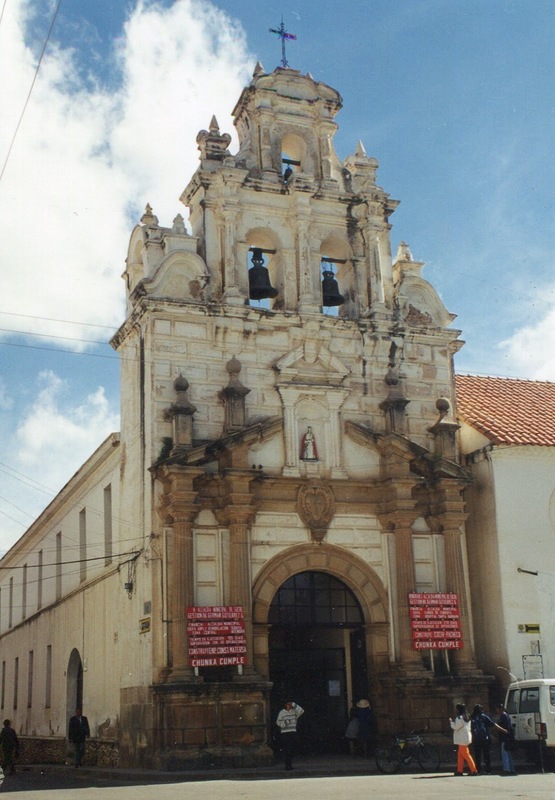 Corumba is on the south bank of a large bend in the River Paraguay. 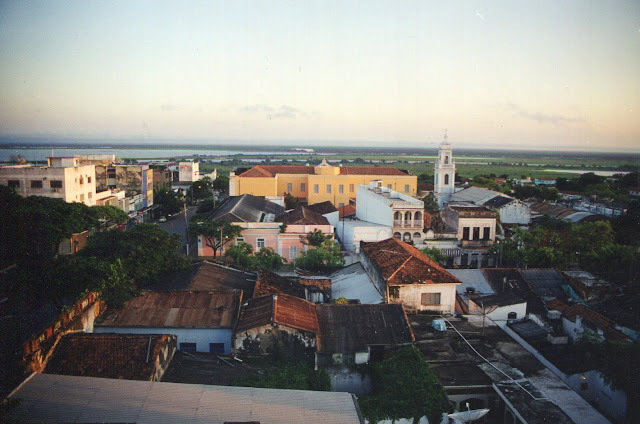 The city offers stunning views of the river, especially at sunset which comes quickly and early in the tropics. 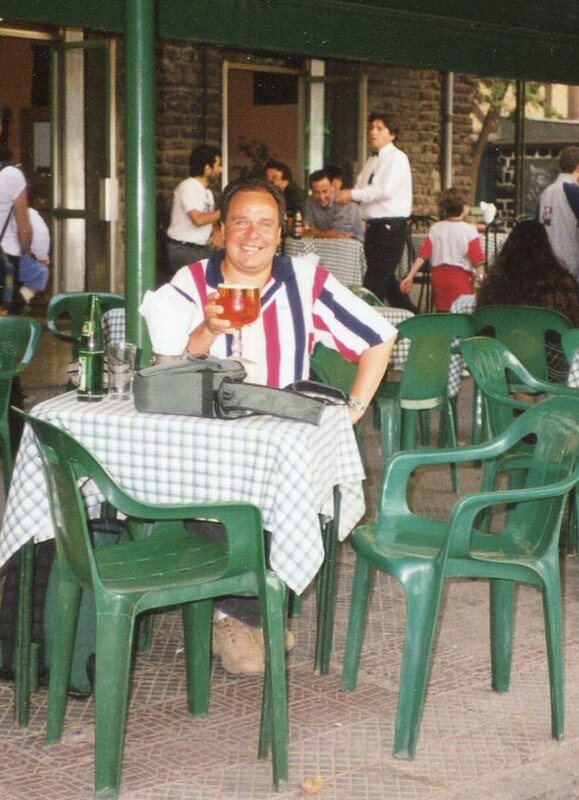 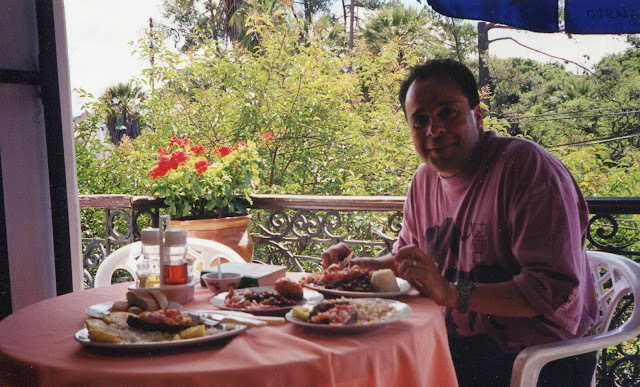 Once you have finished taking pictures, you can venture out to one of the local restaurants for a fabulous “churrasco” style dinner that features huge portions of various cuts of meat impaled on a four foot skewer which the waiter then imbeds into your table. 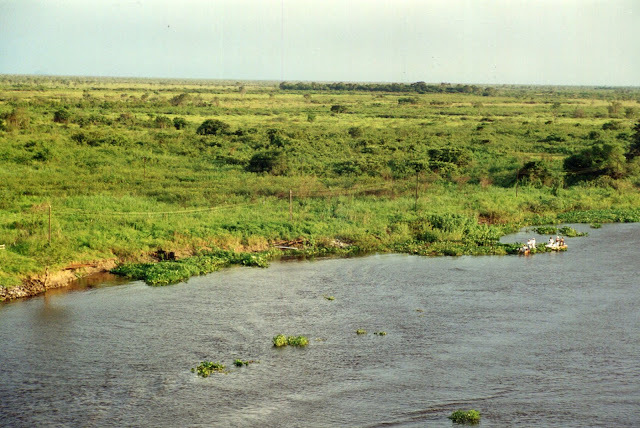 The Pantanal is similar in many ways to the Amazon, though the jungle is less dense, and this makes it much easier to see the wildlife. 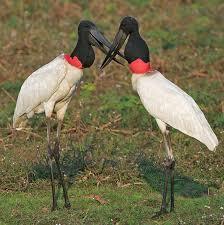 With over 300 species of birds alone, plus hundreds of fish and mammals, there is plenty of wildlife to see. 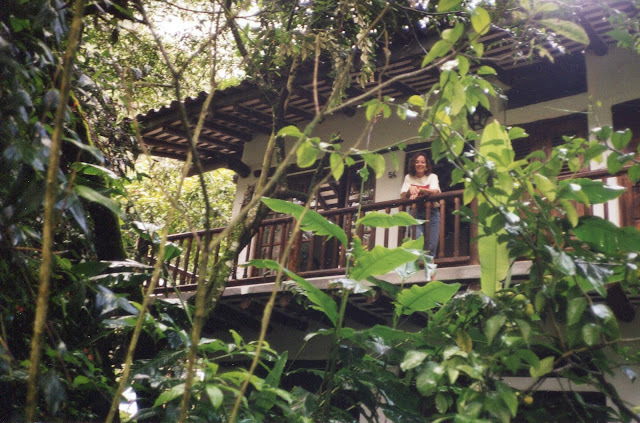 In order to get close to the animals you need to venture away from the town, and stay in a “fazenda” or game lodge. 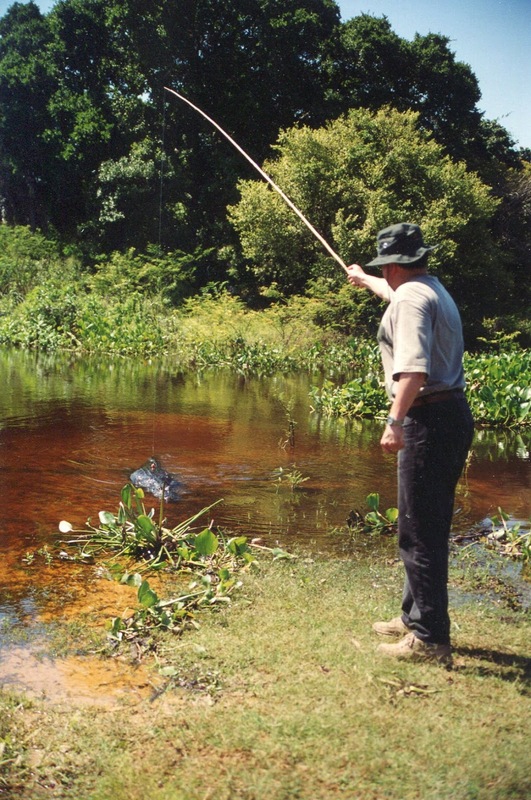 The further away, the better, and there are many fishing, horseback riding and sightseeing packages available. 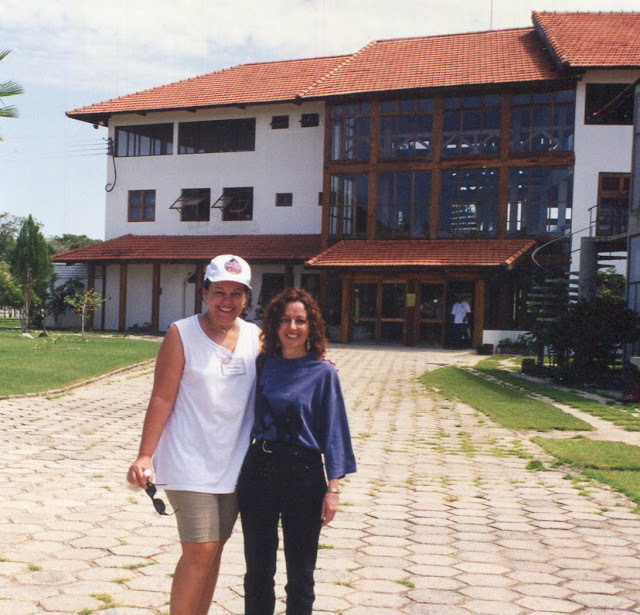 We had made arrangements to stay at the “Pantanal Park Hotel”, and were met in town by local representatives who then took us by mini-van for an hour and by boat for another half hour to a spectacular lodge built above the flood level on an island out in the Paraguay River. 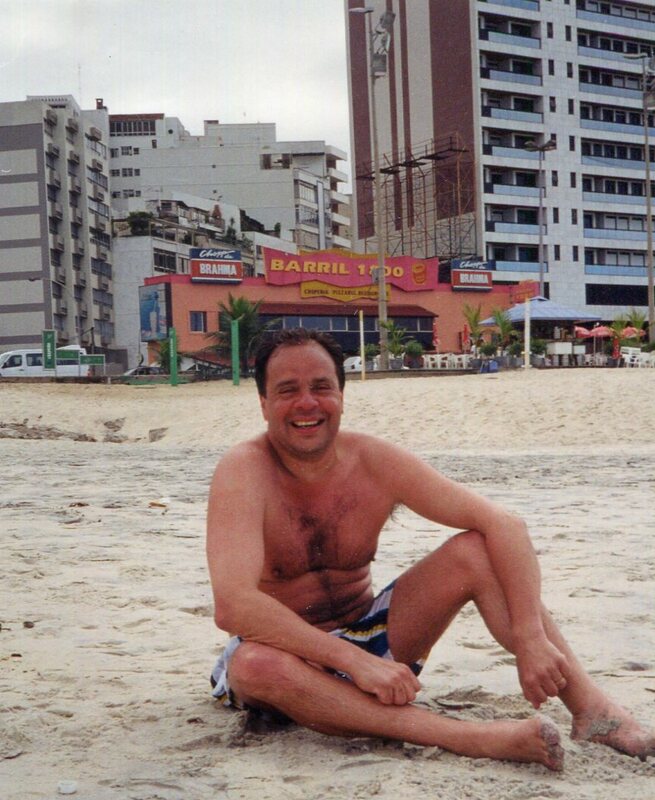 What a place !!! 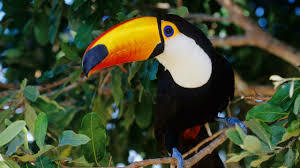 Trees filled with exotic birds like macaws, toucans and parrots, not to mention colourful “tuiuiu” or storks, herons and eagles. 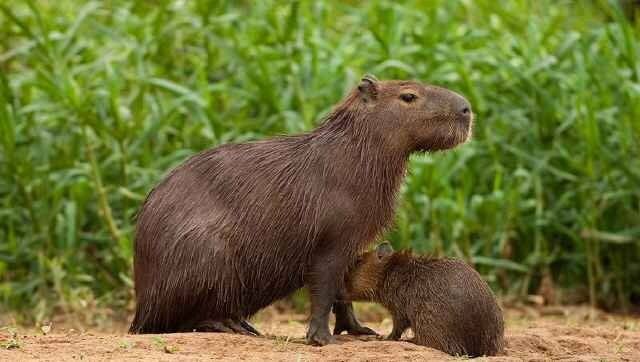 Mammals, including the giant aquatic guinea pigs, known as “capivara”, otters, armadillos, anteaters, monkeys and jaguars wander about, and the waters are teeming with piranha and alligators. 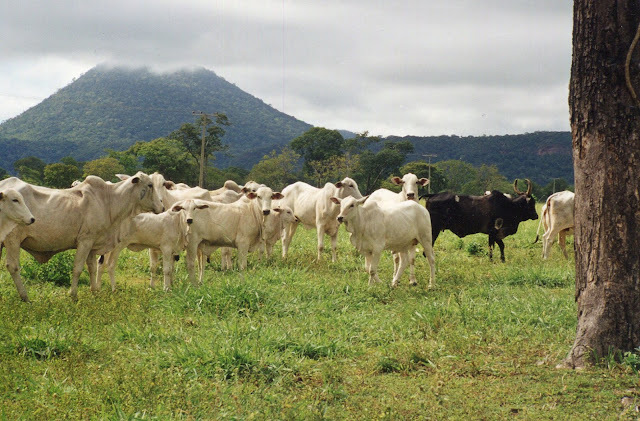 Co-existing with all this wildlife are huge herds of domestic cattle being raised by local farmers who guard the area and ensure no hunting takes place. 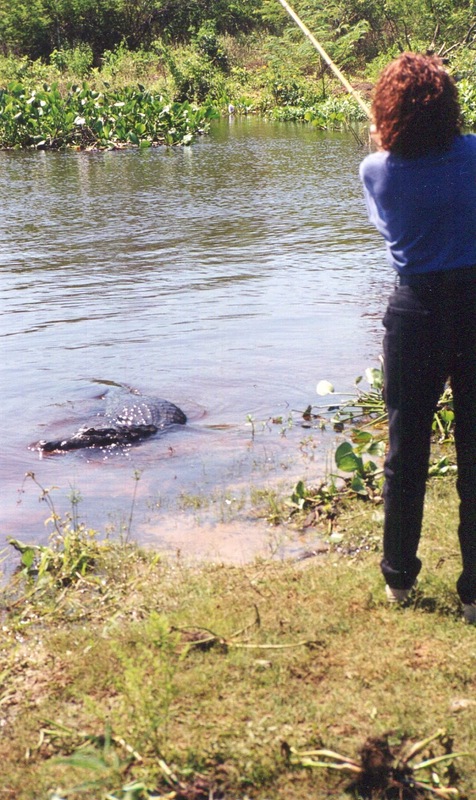 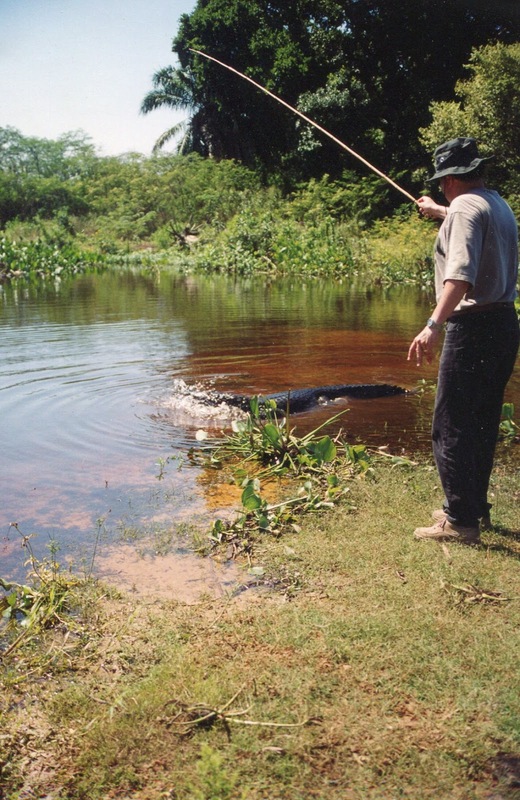 An amazing paradise, with our most memorable moment being surrounded by alligators as we stood on the river’s edge fishing for piranha, which in turn we fed to the alligators!!! 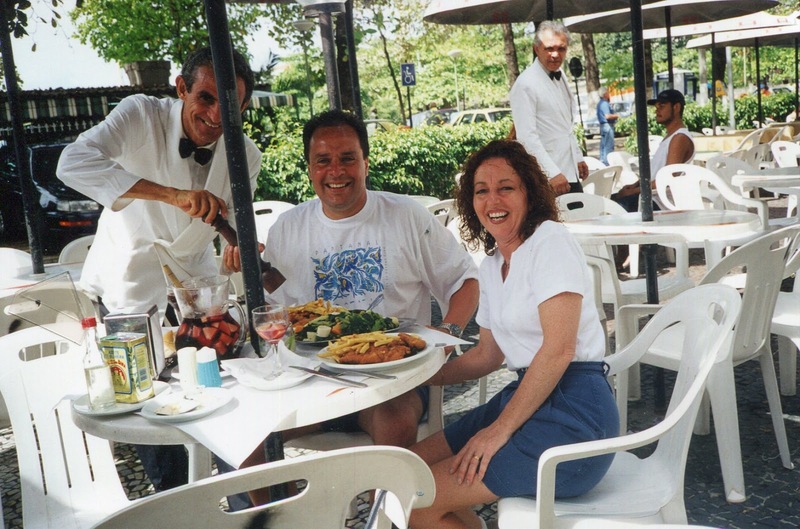 Of course we kept some of the piranha for ourselves which the hotel kitchen was only too happy to make into soup. 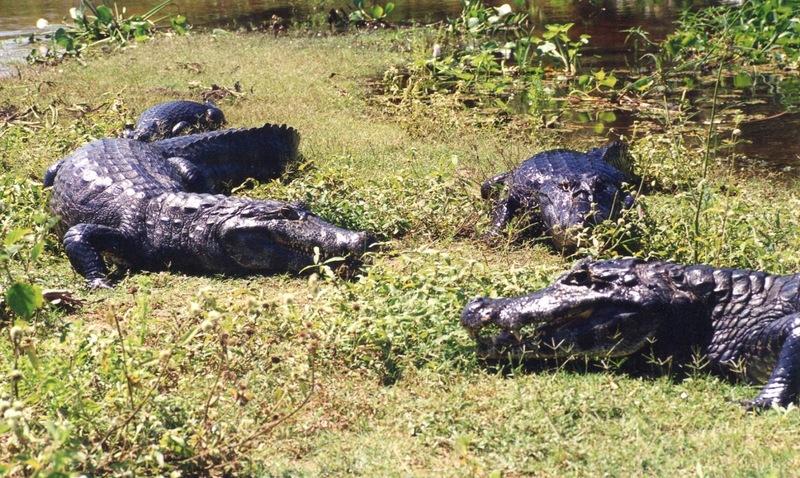 Piranha soup is an alleged aphrodisiac, and everyone has a cupful at cocktail hour !!! 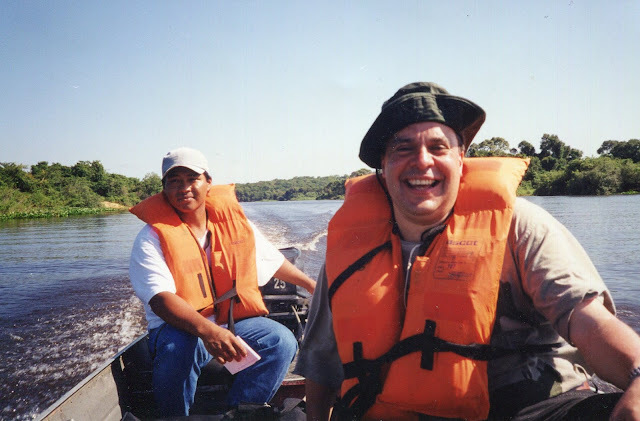 In addition to horseback riding through the local jungle trails we also toured the surrounding river area in a motorized canoe. When our hosts suggested a little horseback riding through the local jungle trails we eagerly accepted the invitation and followed our guide to the barn to get saddled up. 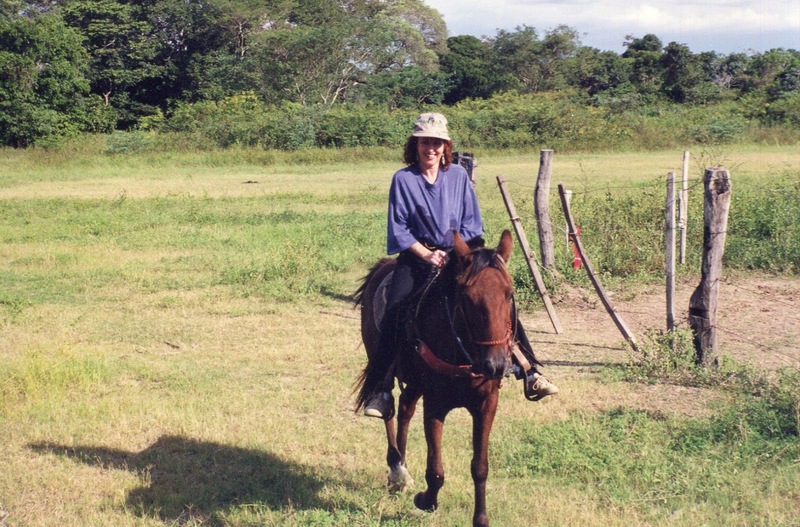 A smaller horse for Junie was waiting patiently and next to it was presumably mine with the groom beckoning me to get up. 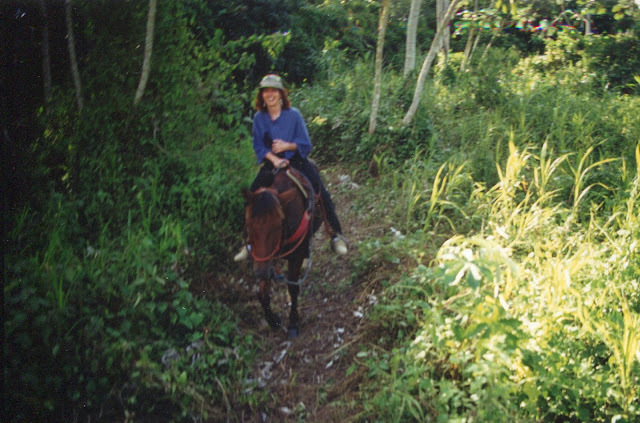 At least that's what I thought he was trying to say when I jumped off the platform, grabbed onto the saddle horn, and tried to put my feet in the stirrups before suddenly swinging in a nearly complete 360 around the horse's body and landing on my back under its belly. With everyone laughing at me and making the easily recognizable two-handed pantomine of a photo opportunity, I belatedly realized the saddle had not yet been cinched and the groom had been trying to tell me to wait. 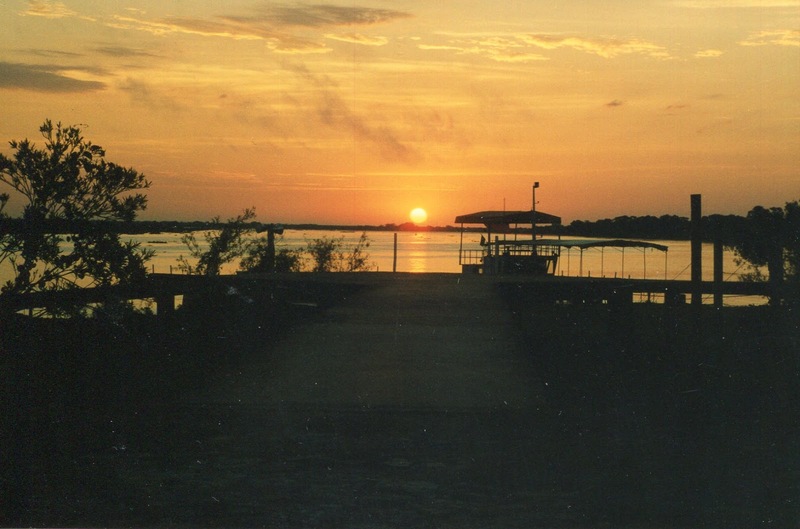 After dinner when the mosquitoes have all gone to sleep, we went for a night ride in a jeep which provided an illuminating experience to say the least when the guide shone a spotlight along the riverbank and you could see for yourself the hundreds of alligators and other creatures carefully going about their business. Definitely not a good place for skinny dipping!!! The Pantanal was a hard act to follow, but fortunately our next stop, Rio de Janeiro, was more than ready for the challenge. Rio may pretend it has a business centre, but all that work stuff really belongs to Sao Paulo, (population 18 million) the largest city in South America. 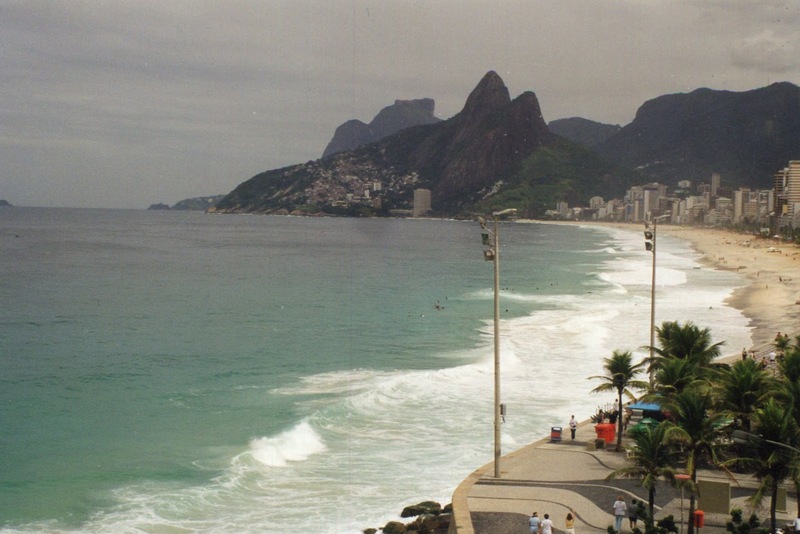 Rio, (population 6 million) is first and foremost a party town, set in the most stunning location in the world, with miles of famous beach wrapped around a collection of small green mountains. 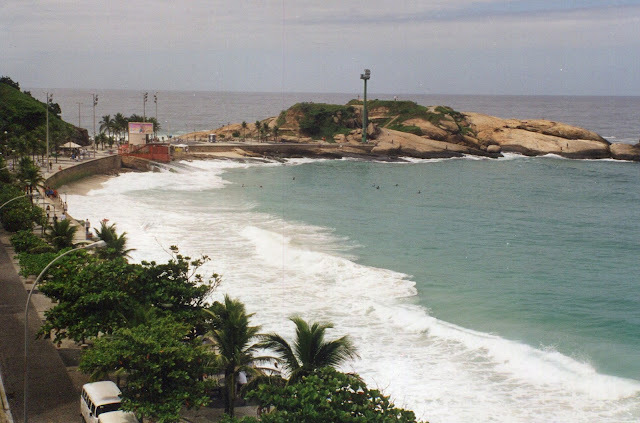 Checked into our nothing special hotel the Arpoador Inn with the best location at the end of the most famous beach in the world and took in the view of gorgeous Ipanema from our room before going out to soak up as much as we could. 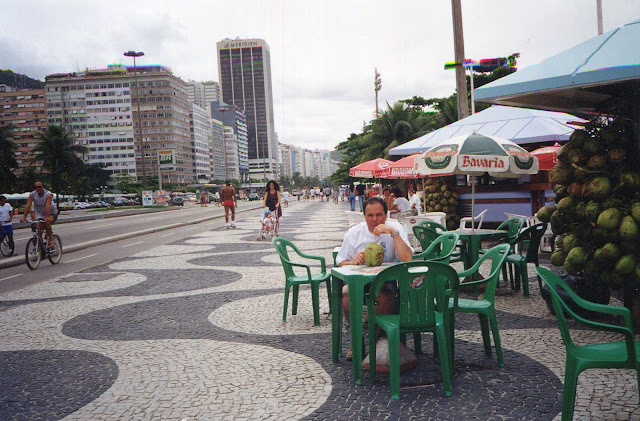 We only had a couple of days in Rio thanks to some muddled up paperwork from the earlier Brazilian border crossing in Corumba that caused us to spend a night in Campo Grande but we were determined to put all that behind us and get into some of the Bossa Nova vibe. We had drinks at the famous Garota de Ipanema where the song "Girl From Ipanema" was written, walked along the promenade and marvelled at its intricate mosaic patterns, checked out the beautiful people at Ipanema and Copacabana suntanning and playing volleyball, and of course went for a swim in the lovely warm water. 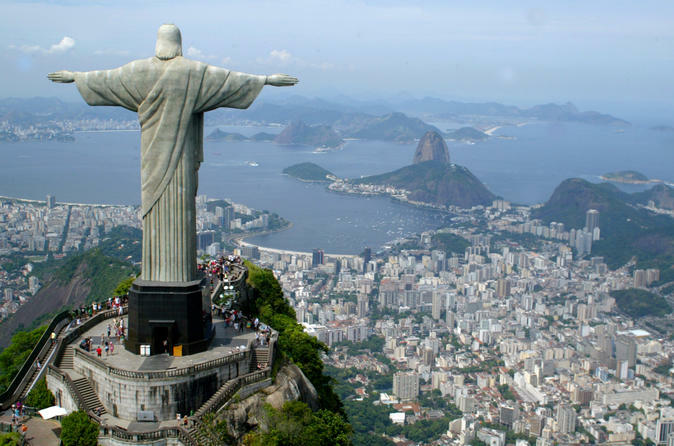 A ride up the Corcovado chairlift for a glimpse of the view God had when he made the place, (on the 7th day according to local legend) was of course a requirement and a chance, yet again, to see the reappearing Christ the Redeemer (Cristo Redentor) while overlooking downtown Rio, Sugarloaf Mountain and the beaches of Copacabana and Ipanema. 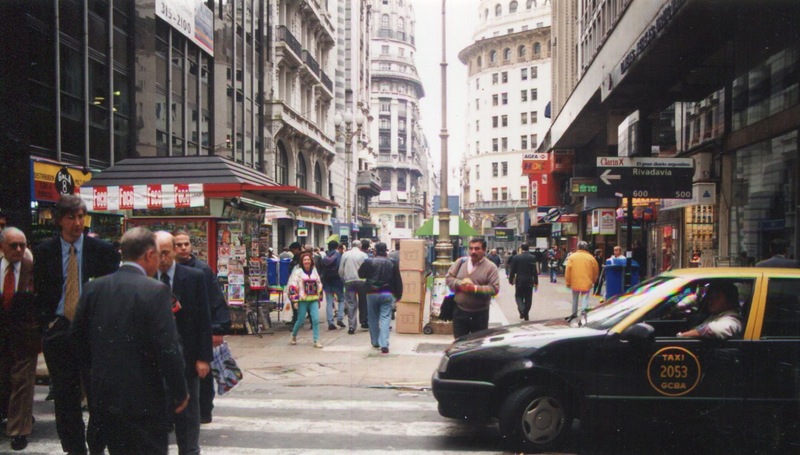 The next country to visit was Argentina, and where else to start but Buenos Aires, (population 3 million) the cosmopolitan magnet and centre of sophistication for South America. 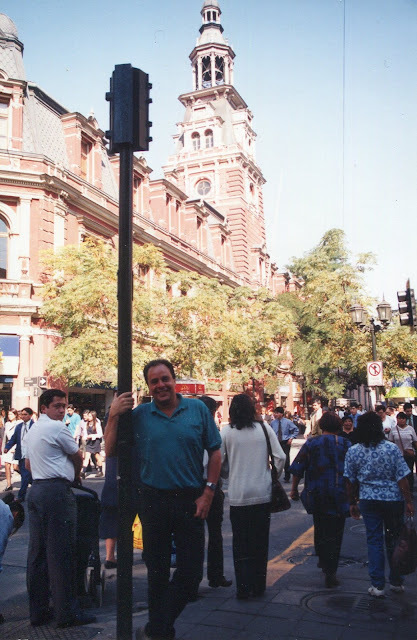 You could easily be fooled into thinking you had stumbled somewhere into Europe, particularly Paris, because the buildings all have that French Second Empire style of mansard roofs, innumerable cupolas and general beaux-arts classicism. 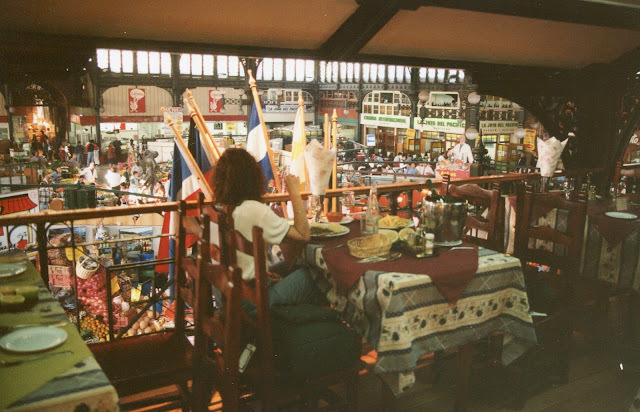 On every street corner there is a French style café serving espresso and pastries, and Peugots seem to be the dominant automobile. The Avenue 9 de Julio, reputedly the widest in the world, is clearly an attempt to outdo the Champs Elysee, and Buenos Aires also boasts a spotless Subterraneo or Metro/subway, the first ever built in South America. 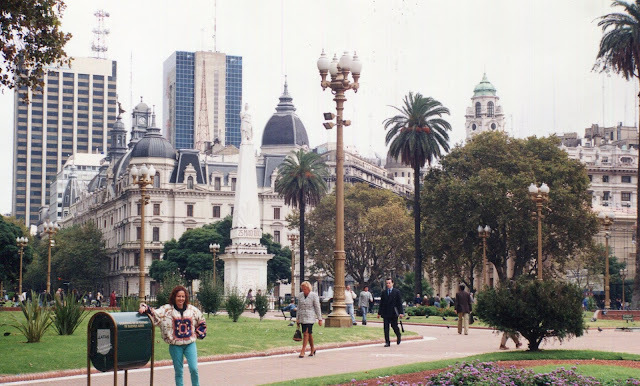 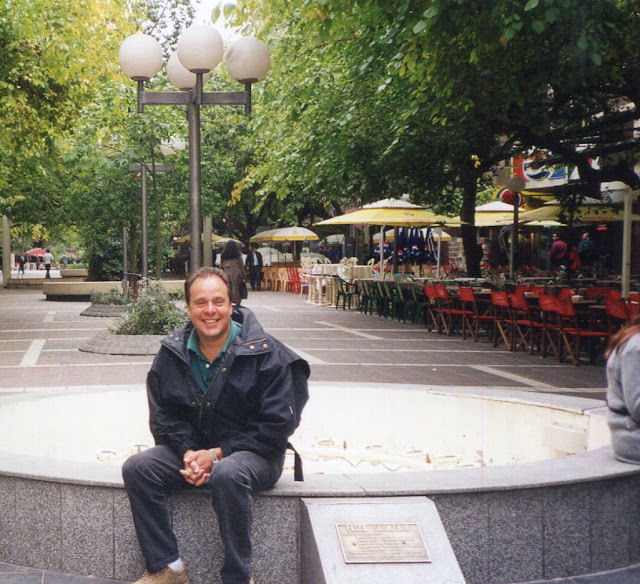 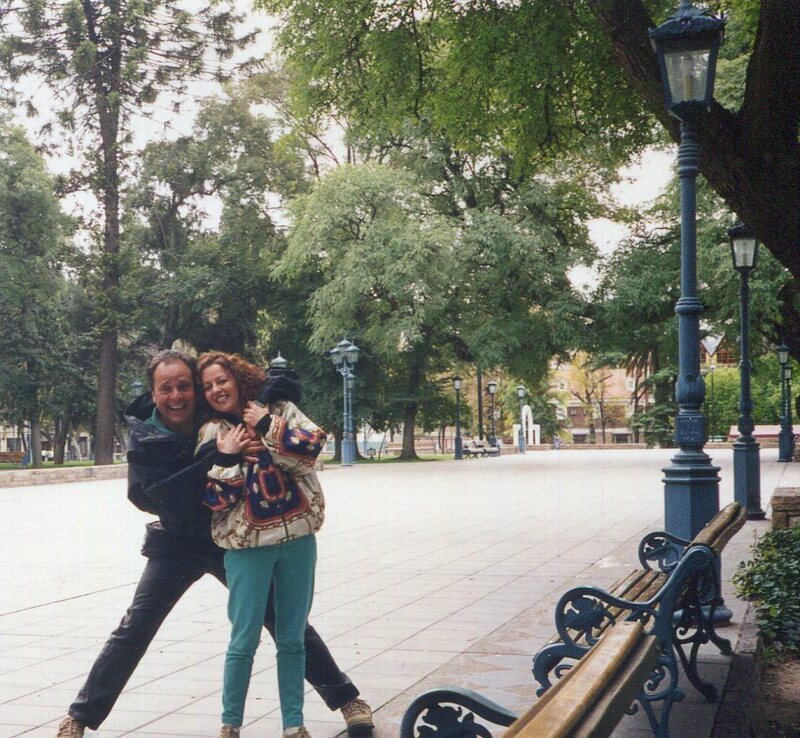 Buenos Aires has the most magnificent collection of parks and plazas, including of course the Plaza San Martin, the Plaza de Mayo, and the incredible Palermo Parks with their wide avenues, beautiful gardens and trees that seem to branch out forever. 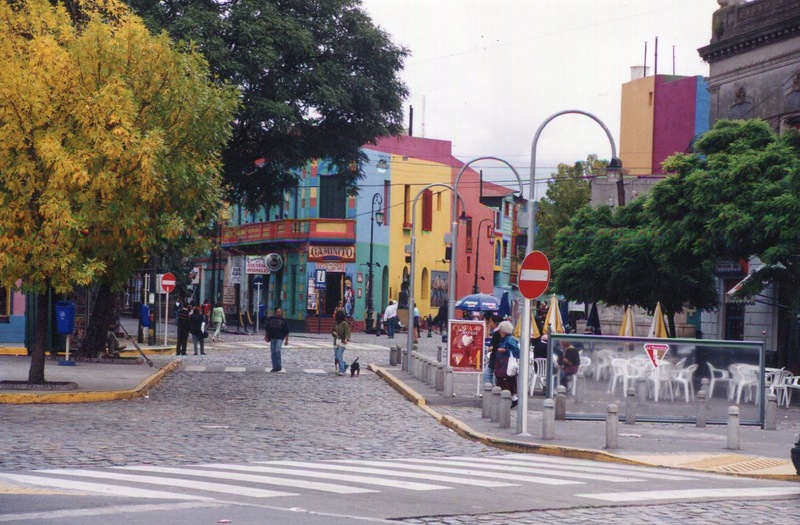 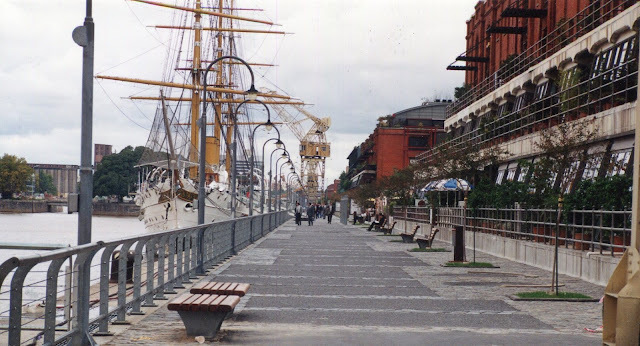 The old port district and a funky tourist area known as “La Boca” are also interesting places to explore as an alternative to all the swank boutiques & shops along Avenue Santa Fe and Calle Florida. 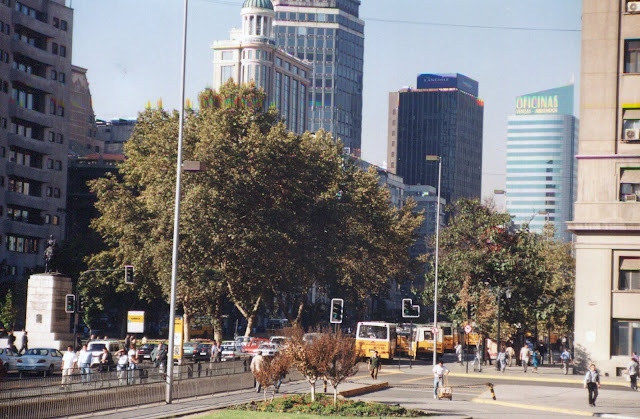 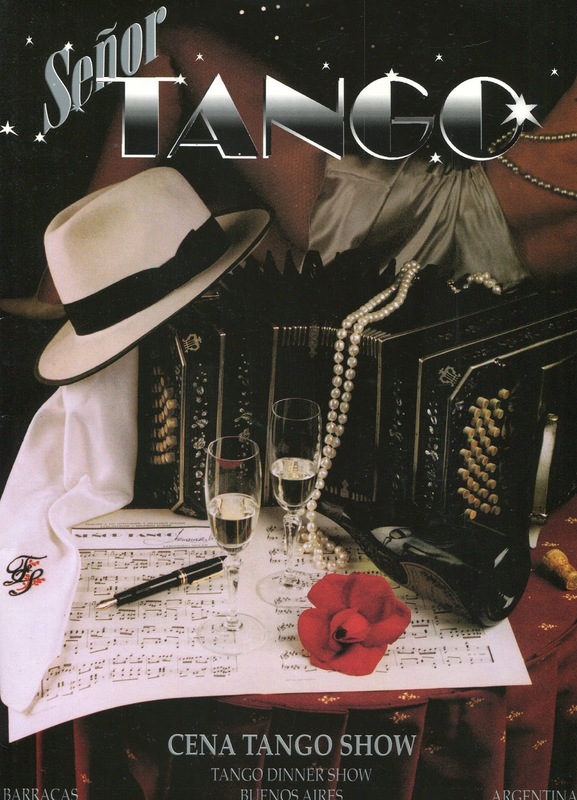 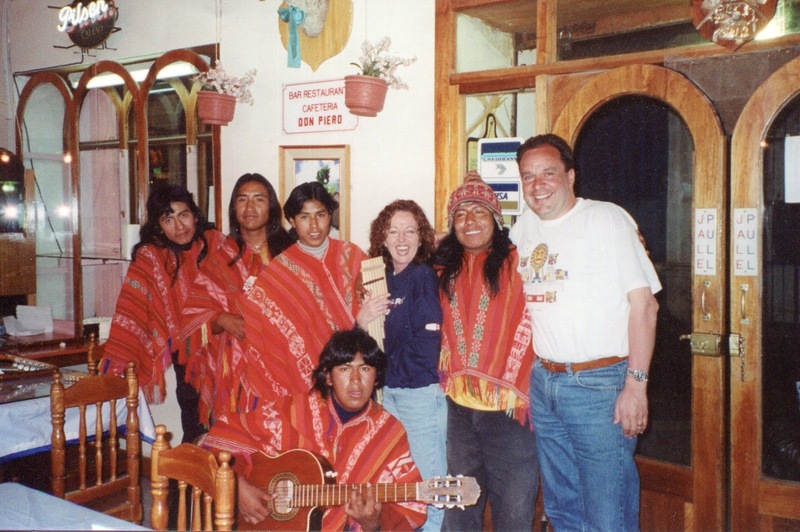 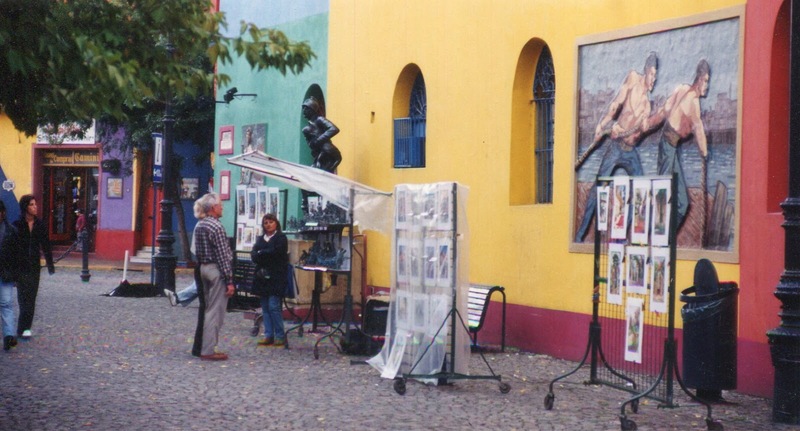 While the people living in Buenos Aires are almost exclusively of European descent, they have developed their own unique culture with Tango music and the “gaucho” or cowboy/rancher being the most well known examples. A Tango show is a thrilling must for any visitor, and the best way to experience “gaucho” is by eating one of their famous thick steaks. 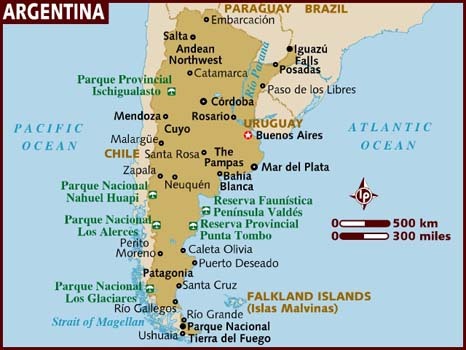 The Argentinians have a particularly delicious way of cooking meat over a wood burning grill that simply isn’t replicated anywhere else. 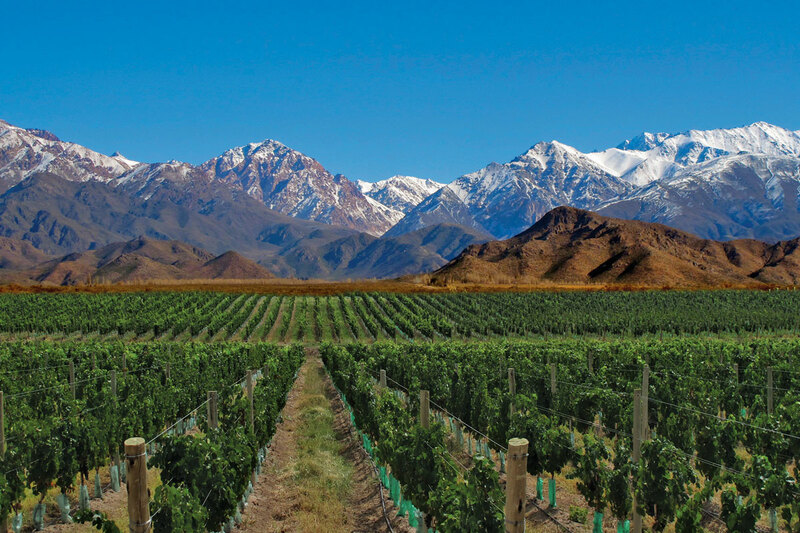 Great meat demands great wine as an accompaniment, and as the 5th largest producer of wine in the world, there is no shortage in Argentina. Particularly in Mendoza, the centre of all the country’s wine production, and “Land of Wine” as proclaimed on the entrance of the airport terminal. 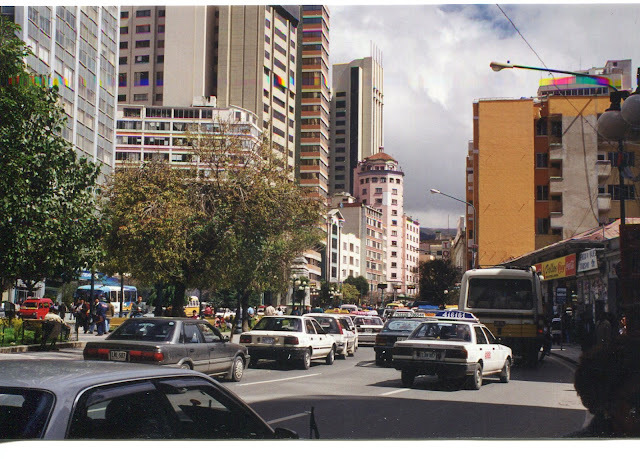 Another jewel of a city, (population 150,000) nestled in the shadow of the Andes and filled with strategically placed plazas, with every street lined with eucalyptus trees whose branches meet overhead to form a lovely green canopy. 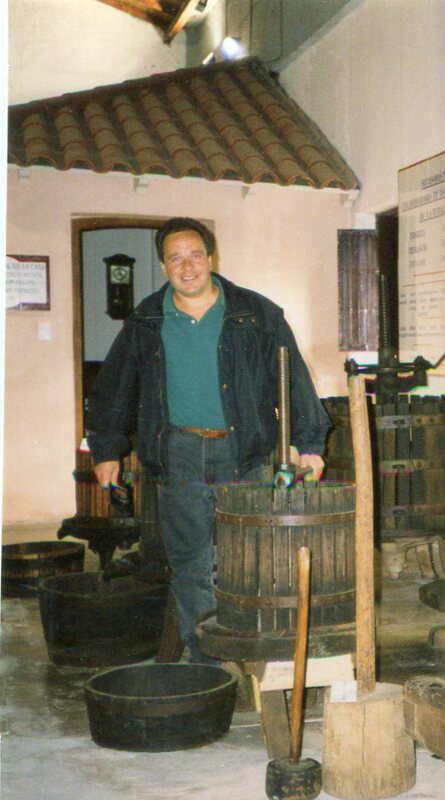 Buses leave on the hour to the many wineries & bodegas in the area, each of which offers a very rewarding tasting experience. 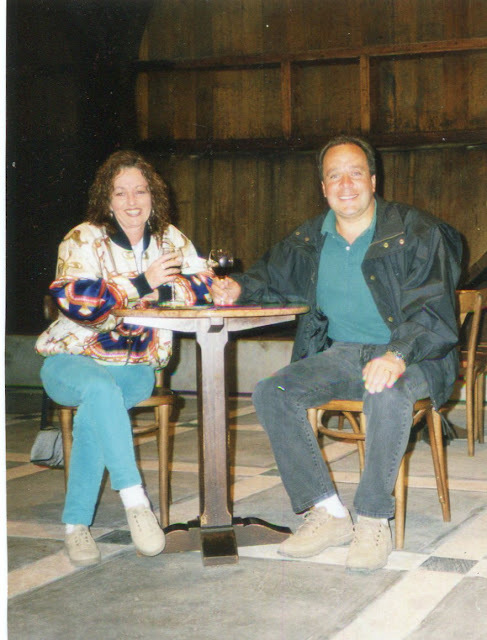 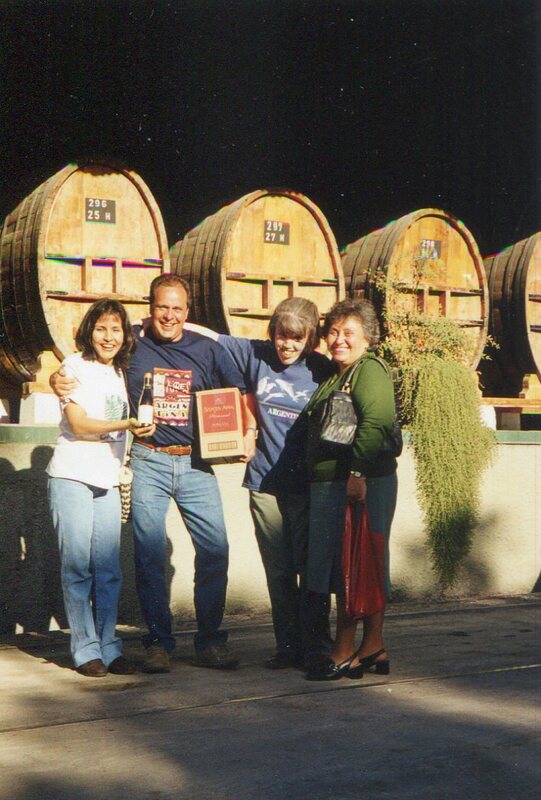 At the Santa Ana winery, for example, by the time we had sampled a half dozen of their wines and stumbled out the door trying to hold onto all of our purchases, we were unable to do anymore wine touring that day!!! 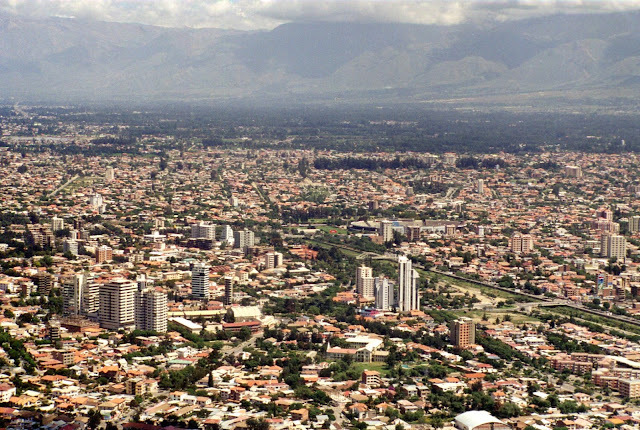 Reluctantly we said goodbye to the land of wine, and flew over the Andes mountains to Santiago, Chile (population 5 million) the 5th largest city in South America. 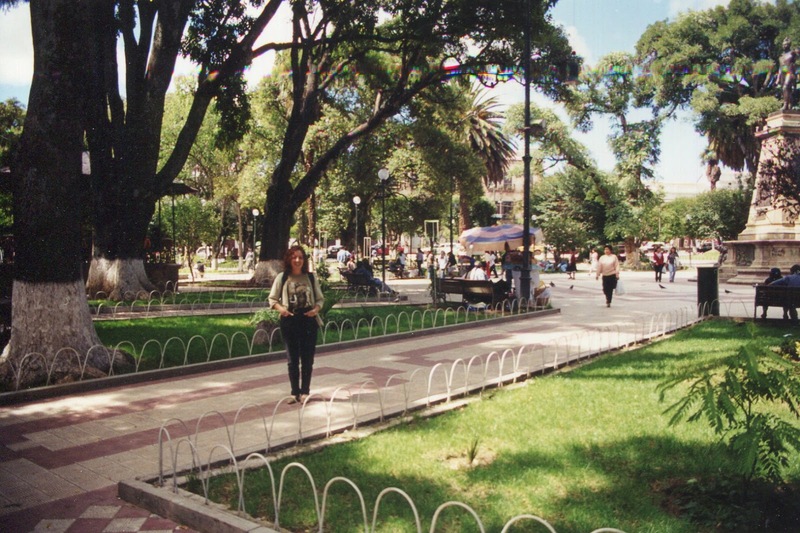 Nicely positioned in a wide plain on the edge of the snow capped mountains, the city has an intensely efficient feel, thanks in part to a modern subway, a clean, well kept park system, and the feverish intensity of its main street, Avenue O’Higgins, which runs the length of the downtown area and is thick with the ubiquitous yellow and white buses of the local transit authority. Between Avenue O’Higgins, and the Mapocho River, is the centre of the old city with its museums, pedestrianized streets, Plaza de Armas, parks, office buildings, and central market. 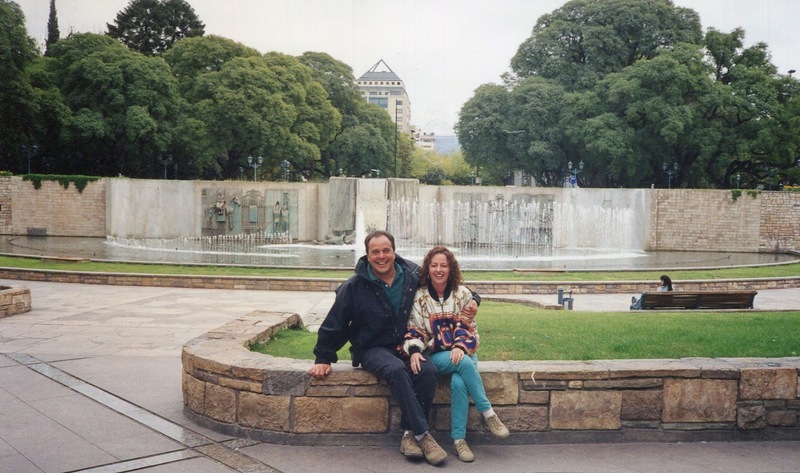 A wonderful area to wander about admiring the more interesting architecture, the classic statues of O’Higgins and San Martin on horseback, and all the hustle and bustle of a city very much on the move. 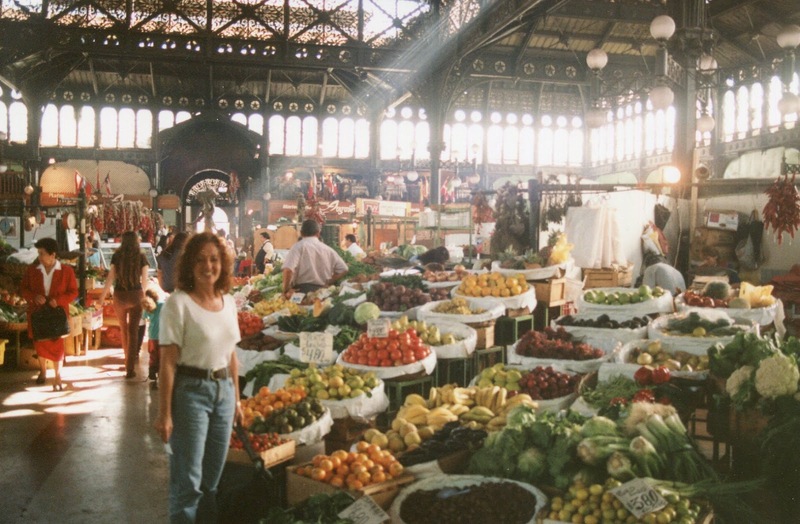 Ready for a change of palate after all the meat of Argentina, and eager to sample the famous Chilean seafood, we wandered into the public market where we were rewarded with a delicious meal of “congrio” or kingclip, shellfish, and giant stuffed avocados which of course we washed down with some superb Chilean wine. 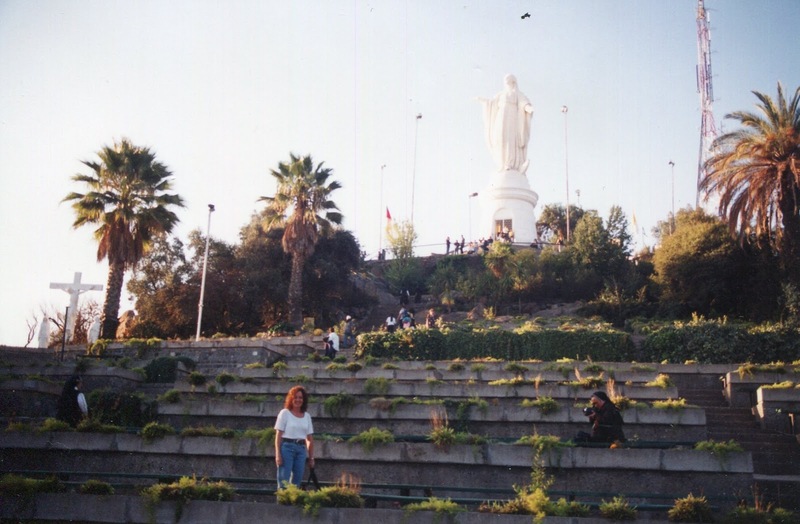 To complete our tour, we wandered through the Bella Vista district and caught a ride on the “funicular/teleferico” or cable car/chairlift system in the Metropolitan Park which offers a superb view of the city from San Cristobal hill, and in good Catholic fashion, also features a colossal statue of the Virgin. 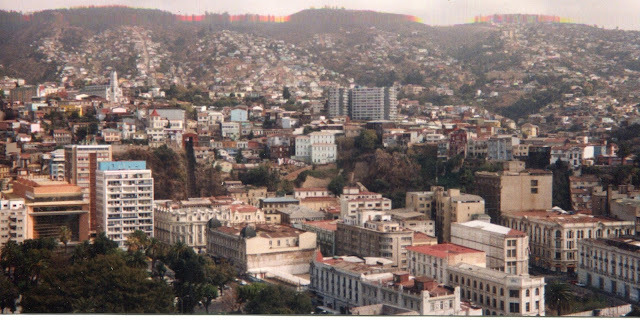 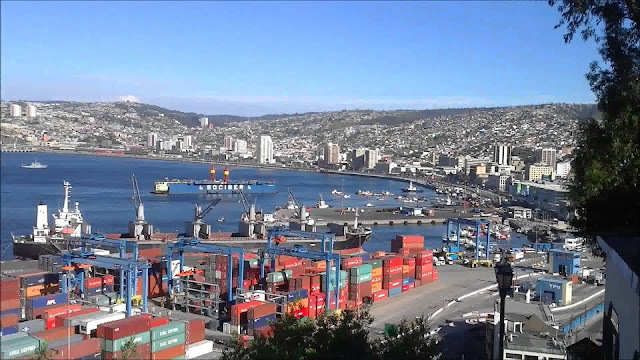 On our last day we also managed to squeeze in a short bus trip to the coast for a little tour around the interesting hillside port city of Valparaiso and a farewell seafood meal in a revolving restaurant with a great view of the city. 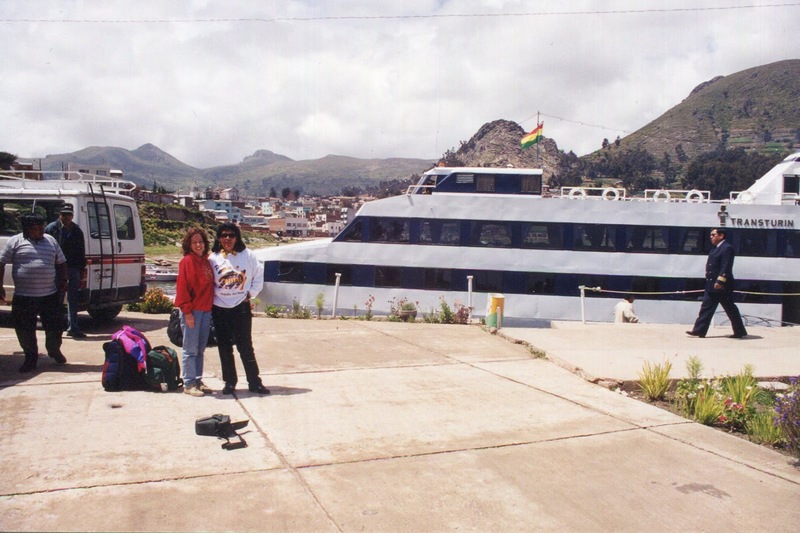 It also gave us an opportunity to reflect on everything we had seen and done. 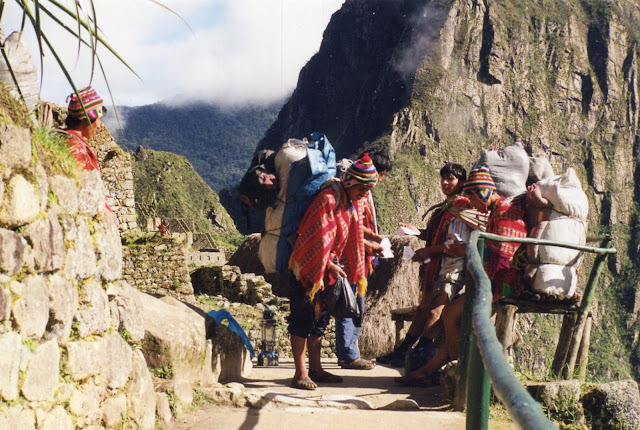 A journey of unbelievable contrasts, from the waters of the mystical Lake Titicaca nestled in the high mountains and arid altiplano of the Bolivian and Peruvian Andes, to the lush jungle and famous beaches of Brazil, and then over the vast Argentine pampas. 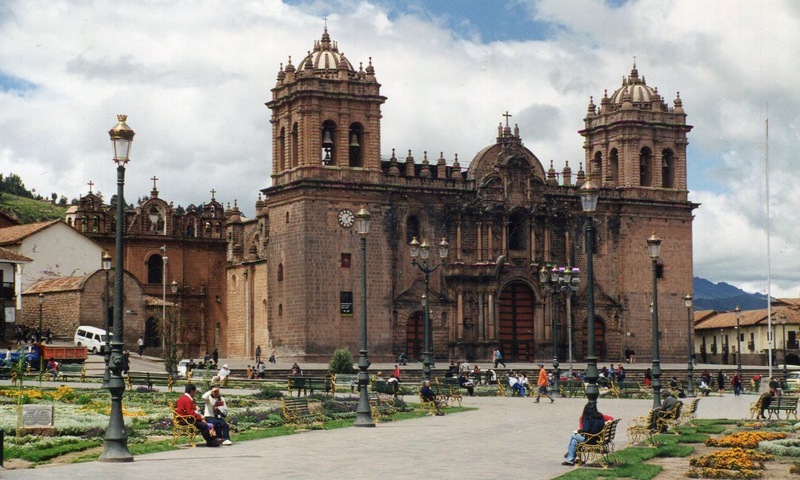 From ancient civilizations to modern times, and through small rural villages and huge sophisticated cities. 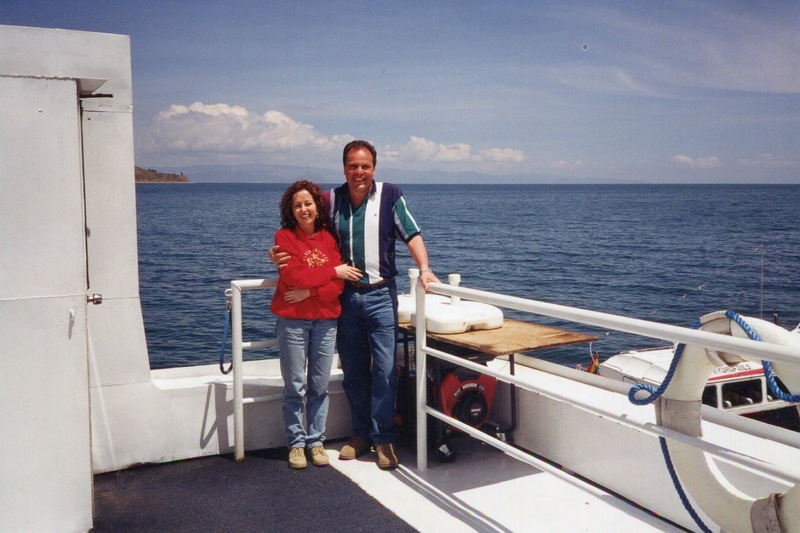 From the Pacific to the Atlantic and back again, by plane, train, boat and bus. All in all quite an adventure and one I shouldn’t have waited so long to experience.